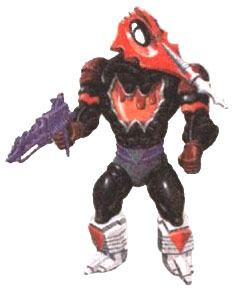 I wasn’t aware of Scare Glow’s existence when he was released in 1987, but when I finally saw him as an adult, he made perfect sense. 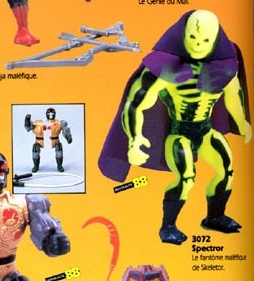 Of course there needs to be a glow-in-the-dark skeleton man in Masters of the Universe. Why didn’t someone think of this sooner? 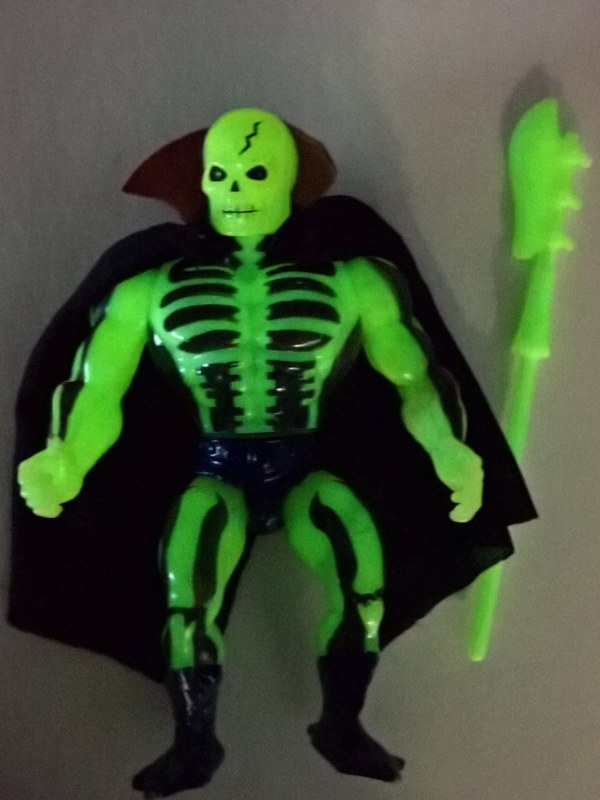 Glow-in-the-dark accessories had been produced previously in the line (Evil-Lyn’s staff, the warrior ring that came with Tri-Klops and Trap Jaw), but never a glow-in-the-dark figure. Scare Glow seems to have been influenced by traditional imagery of the grim reaper. 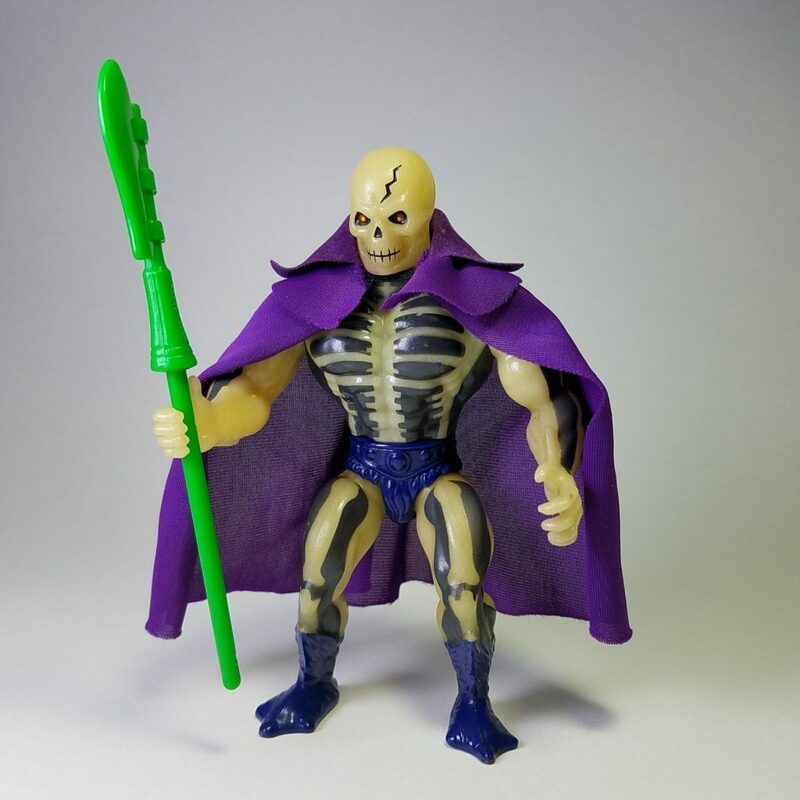 Unlike Skeletor, his entire body is a skeleton (or at least the closest thing to it without creating a newly sculpted body). 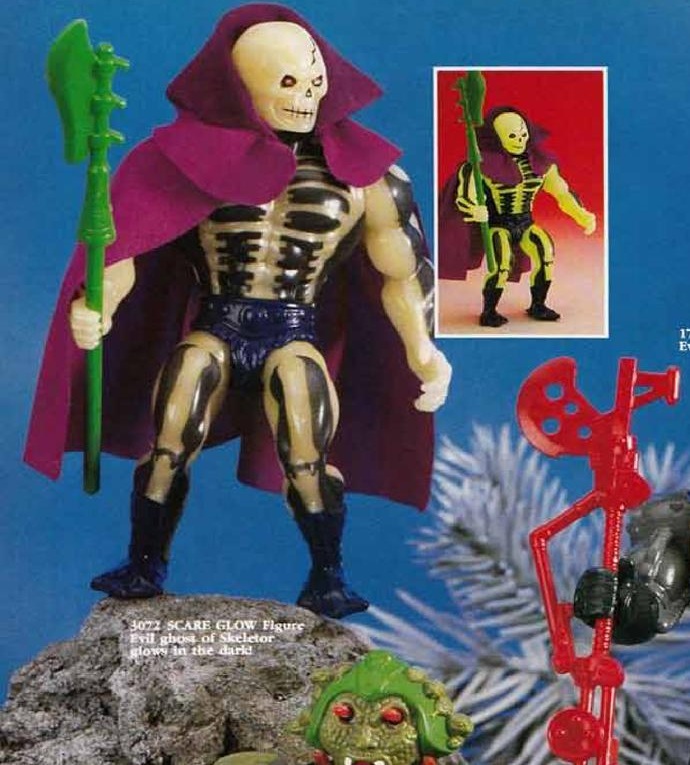 He has a reaper-like cloak and the closest thing to a scythe in the existing library of Masters of the Universe weapons. 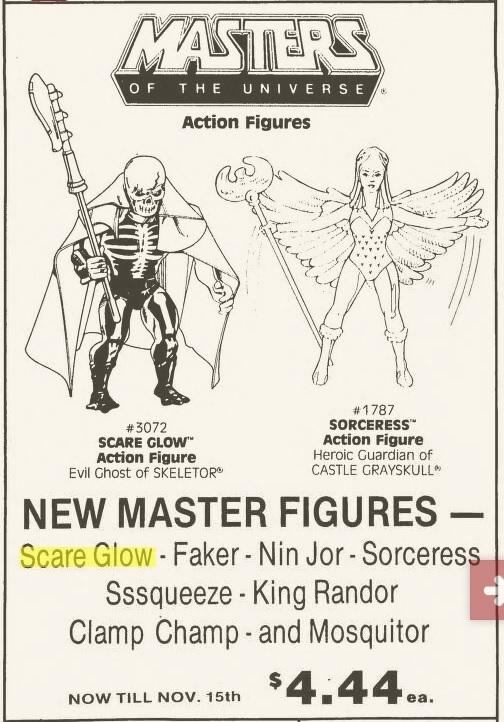 Scareglow was released toward the end of the Masters of the Universe toyline. 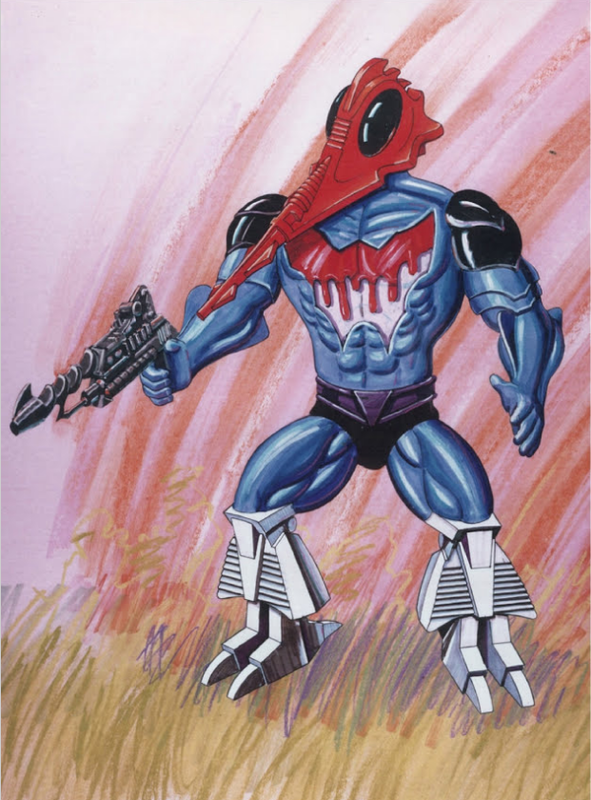 There seemed to be two categories of figures released in 1987 – figures that were made from newly sculpted parts (Mosquitor, Sorceress, Blast Attak) and figures that mostly reused existing parts, with only a new head and perhaps a new weapon (Ninjor, King Randor, Clamp Champ). Scare Glow is in the latter category. 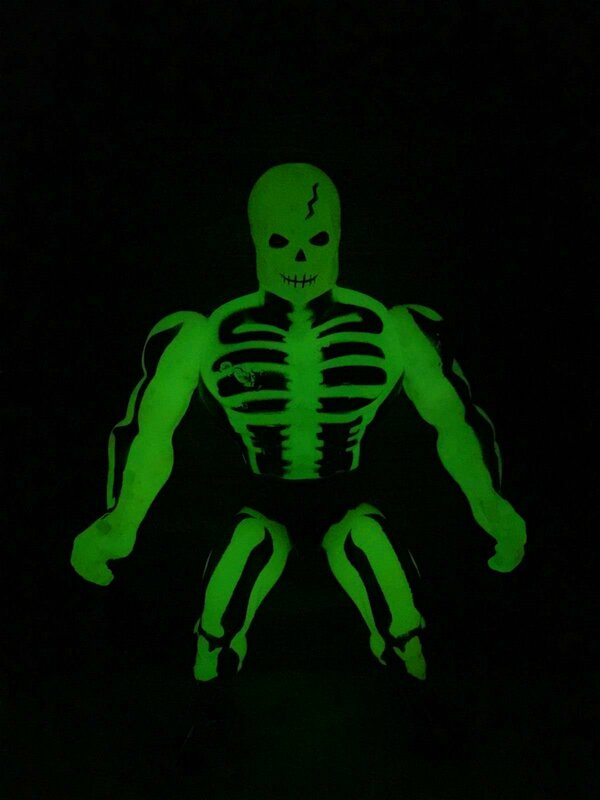 Scare Glow reuses Skeletor’s body. 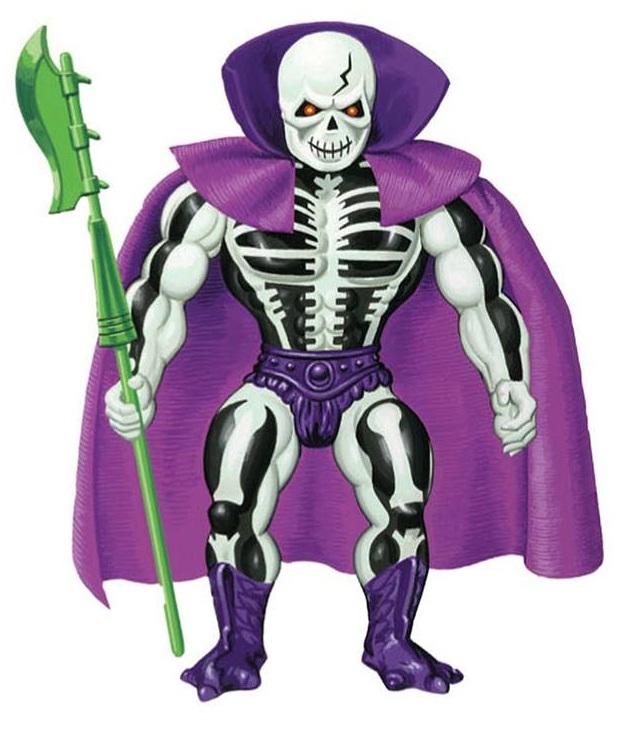 Most versions reuse the legs from Dragon Blaster Skeletor (with slightly enlarged feet compared to the original Skeletor), but the Spanish version reused the original Skeletor legs. 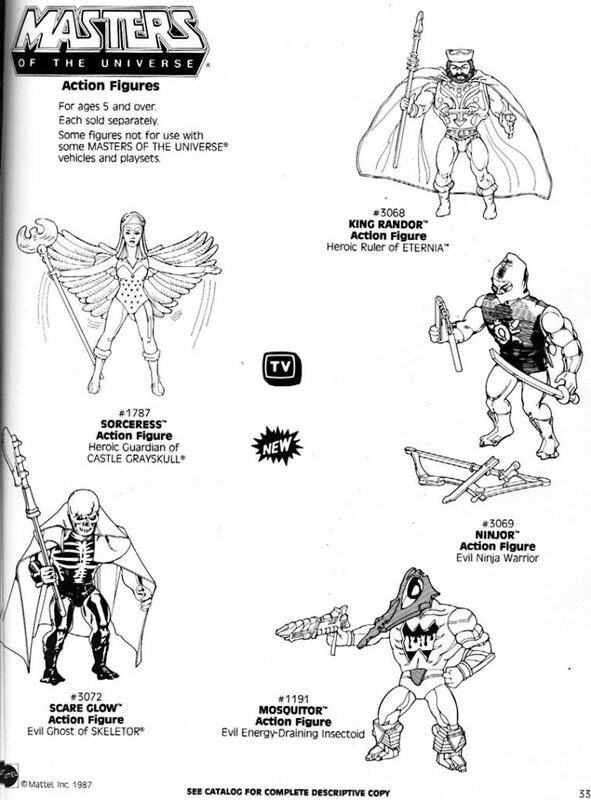 The poleaxe (referred to on the packaging as a “scythe of doom”, and in the style guide as a “spirit staff”) is reused from the Castle Grayskull weapons rack. 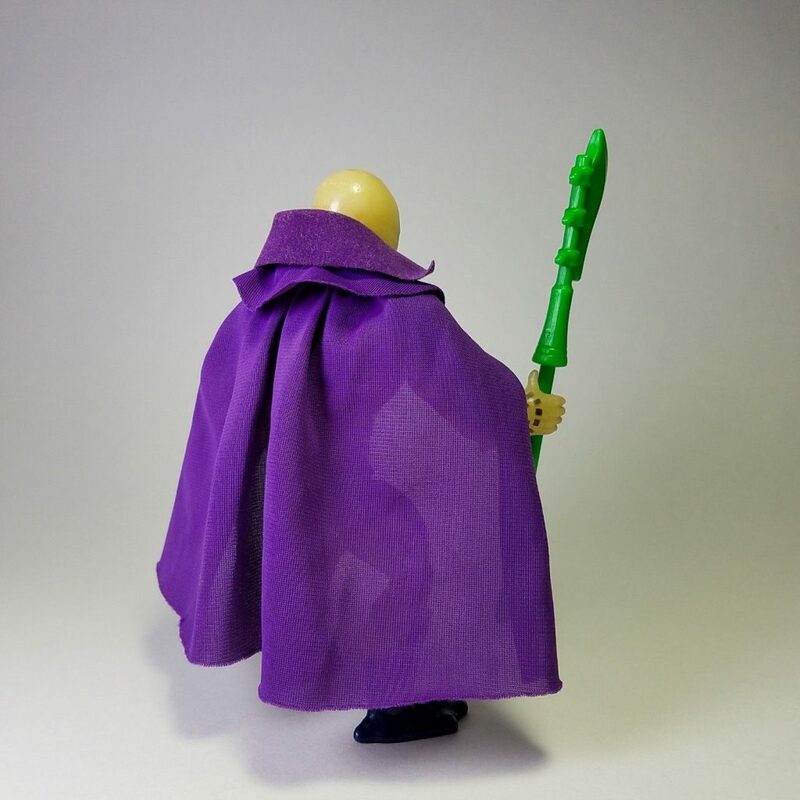 He was given an all-new head and a new cloth cape. 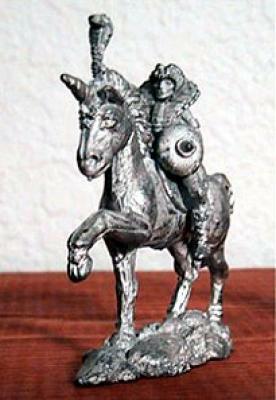 The figure was designed by David Wolfram. 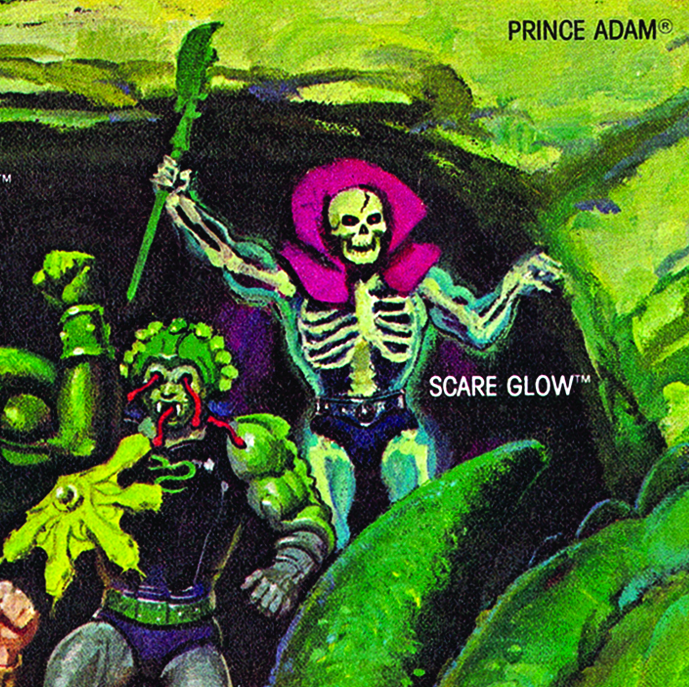 Scareglow’s weapon came in two flavors – bright green and glow-in-the-dark white. The white version was principally sold outside of the US and Canada. 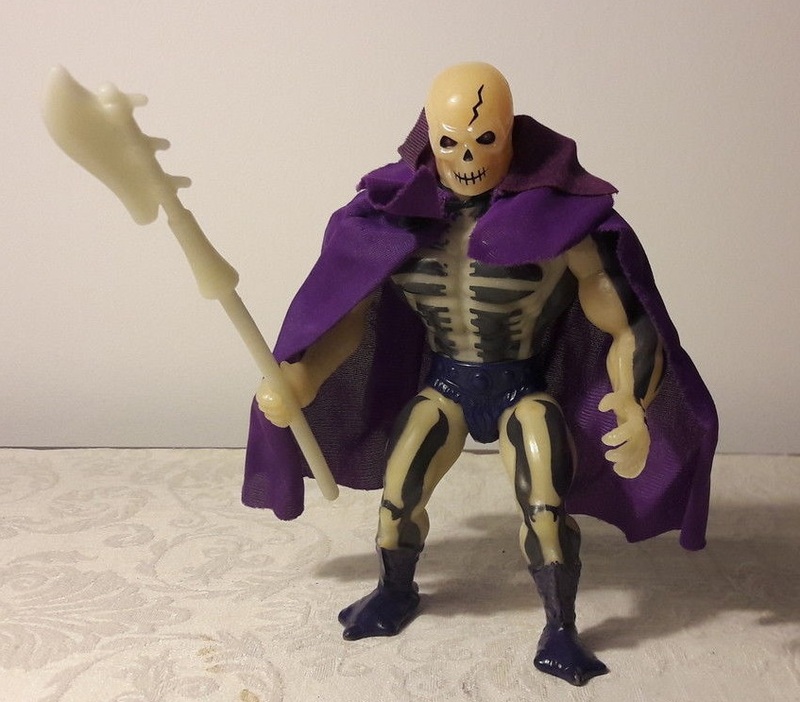 Skeletor conjured up this spirit in his own image to frighten travelers on the pathways of Eternia. Scare Glow is invisible during the daylight, but glows at night. Unfortunately I don’t think this totally clears up the issue. 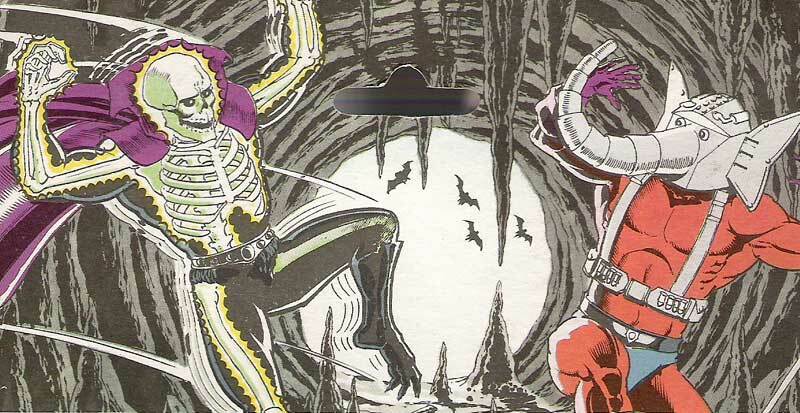 From the short bio, Scare Glow could be Skeletor’s ghost, or he could be just a ghost who happens to have a skull face like Skeletor. 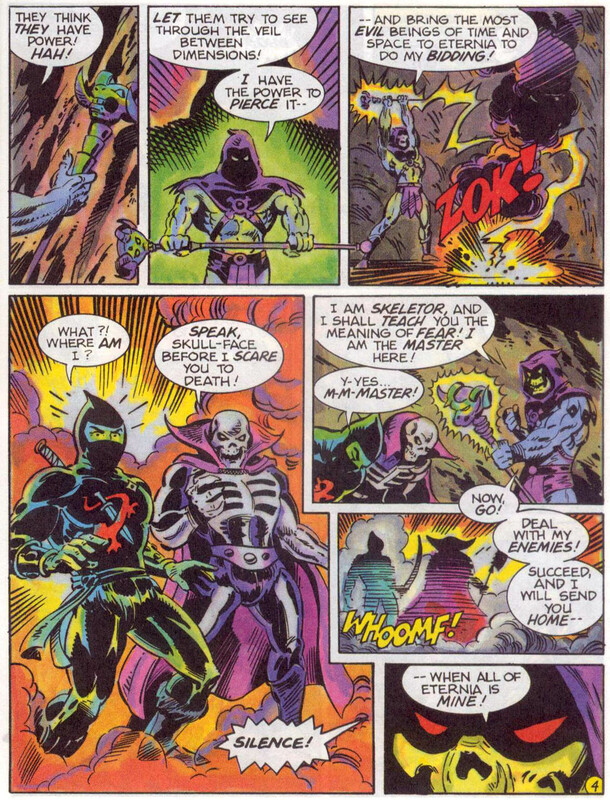 In the mini comic, The Search For Keldor, Skeletor conjures up “the most evil beings of time and space” (Scare Glow and Ninjor). 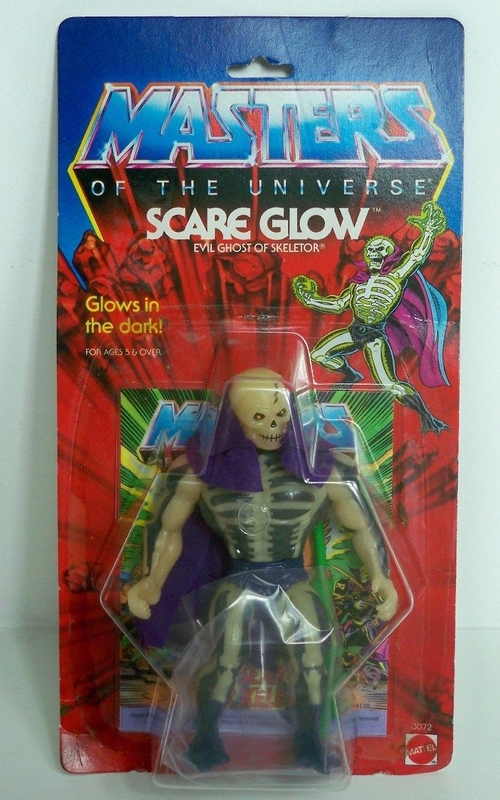 So it could be that Scare Glow really is a future, deader Skeletor. 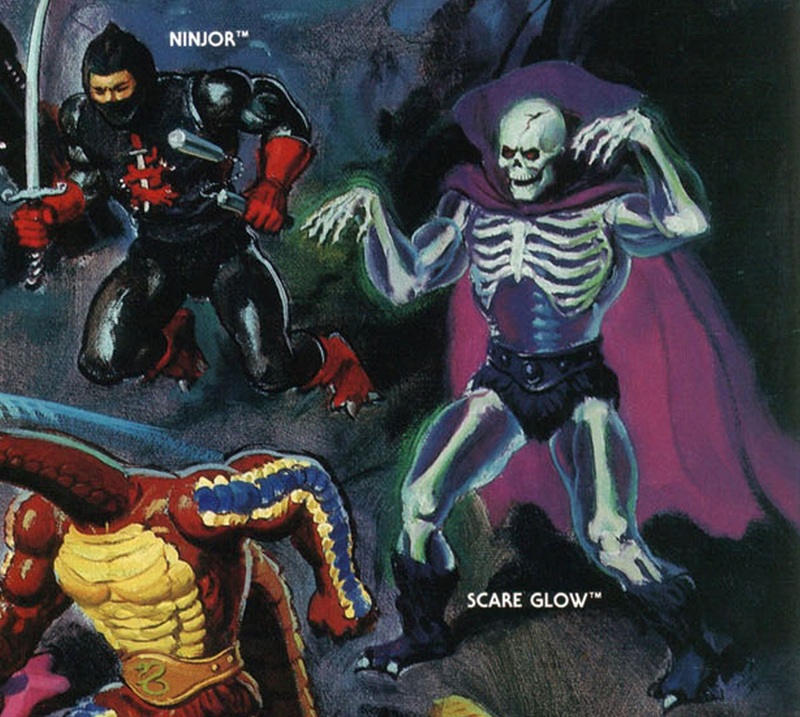 I tend to think that Scare Glow is not Skeletor’s own ghost, however. 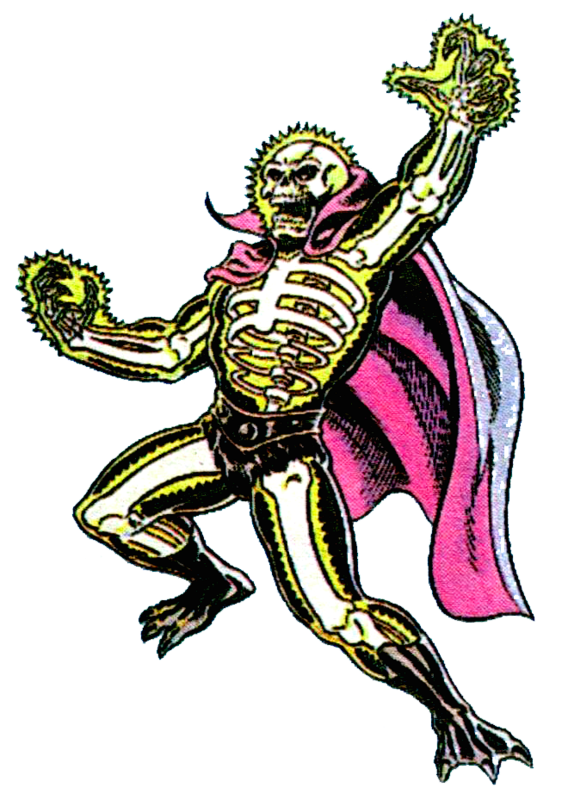 I think the intent was that Scare Glow was just a conjured being who happens to look a bit like Skeletor. 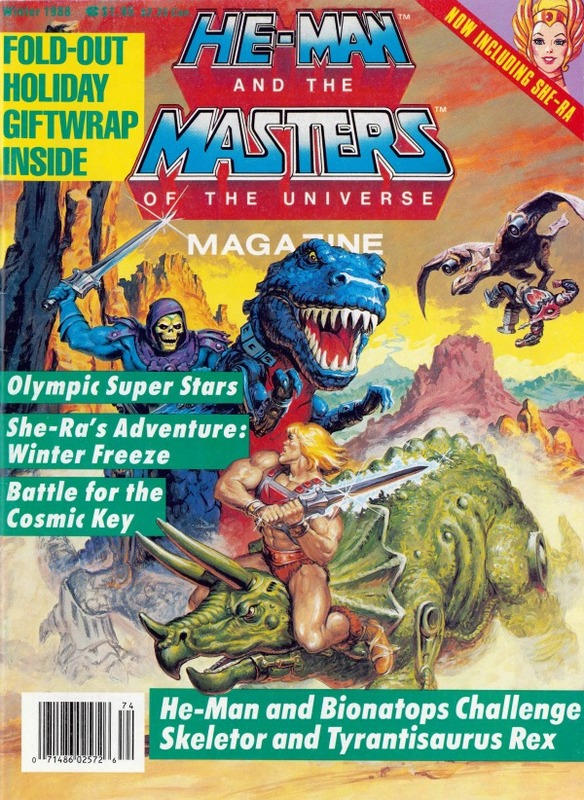 The scans of catalogs and advertisements used in this article came from Orange Slime, Grayskull Museum, and He-Man.org. 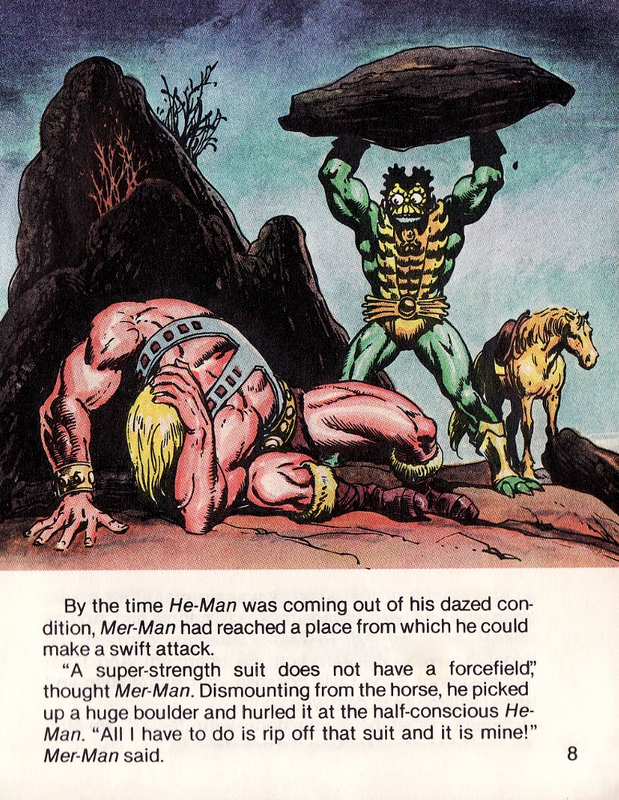 The Errol McCarthy line art and comic book scans also came from He-Man.org. 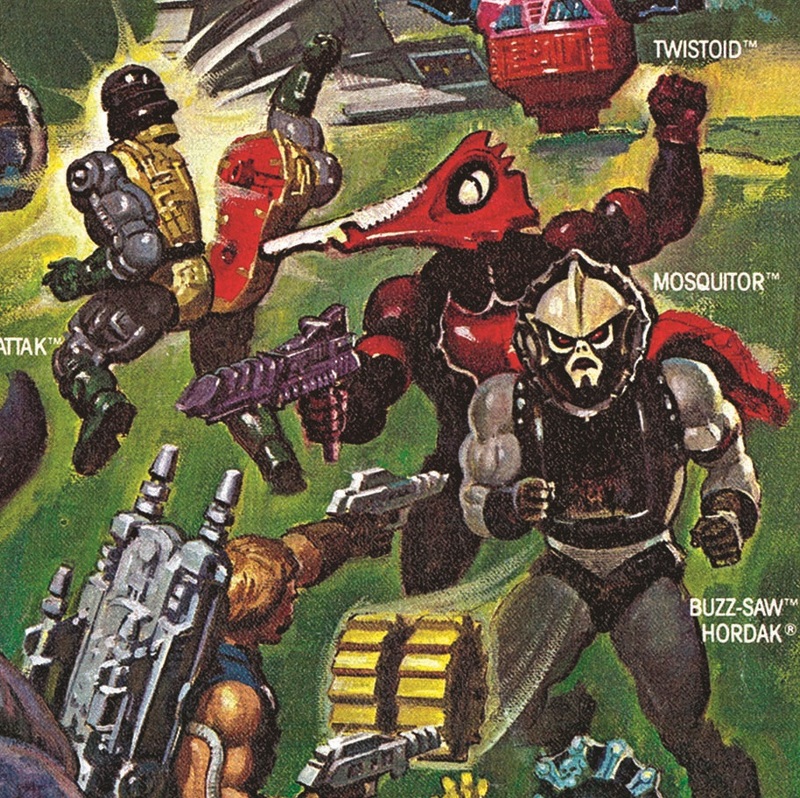 Mosquitor is one of the few late Masters of the Universe figures that I was aware of as a kid. 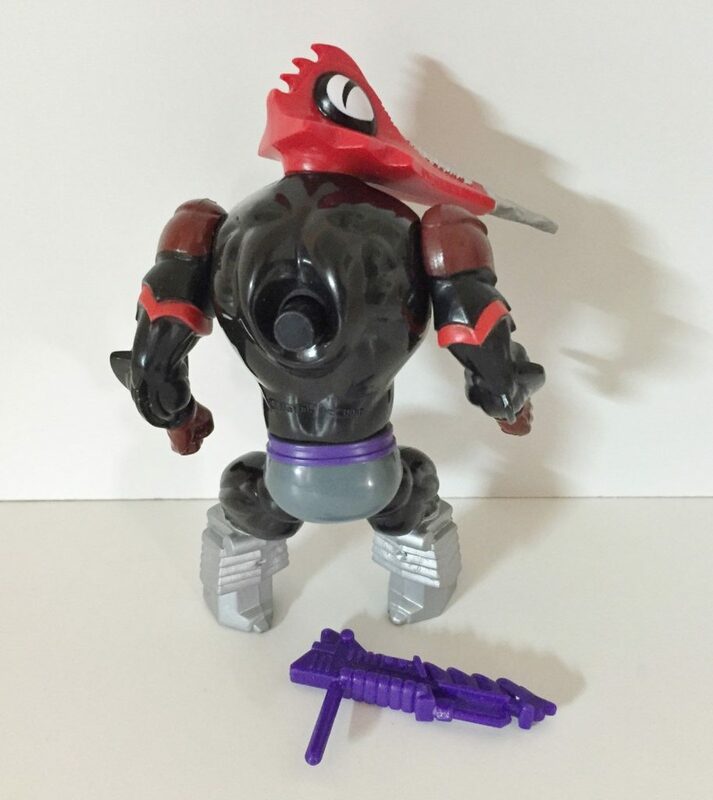 The last figure I got was probably Rattlor (1986). At that point I was more interested in G.I. 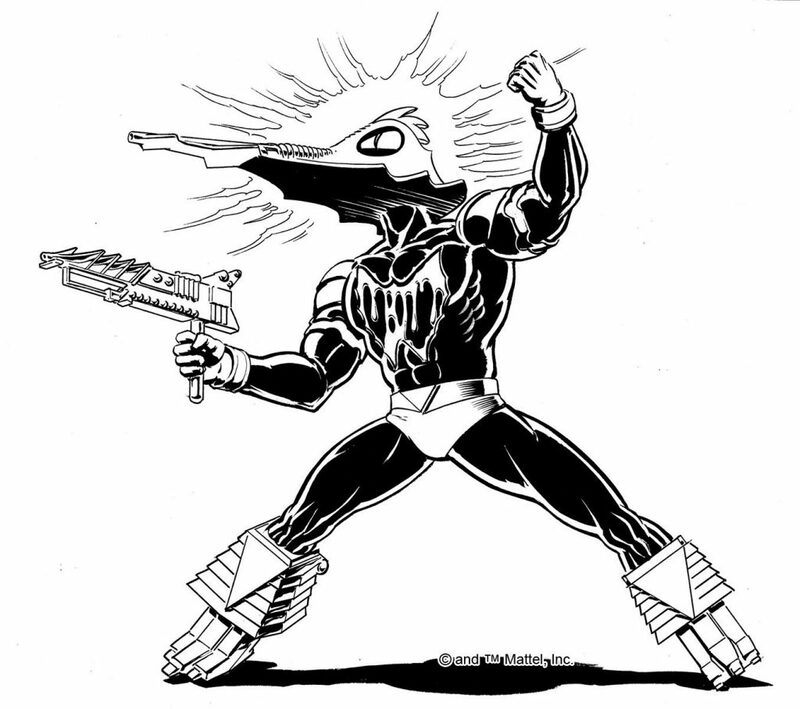 Joe (although I loved the Snake Men, and in my mind associated them with Cobra-La). 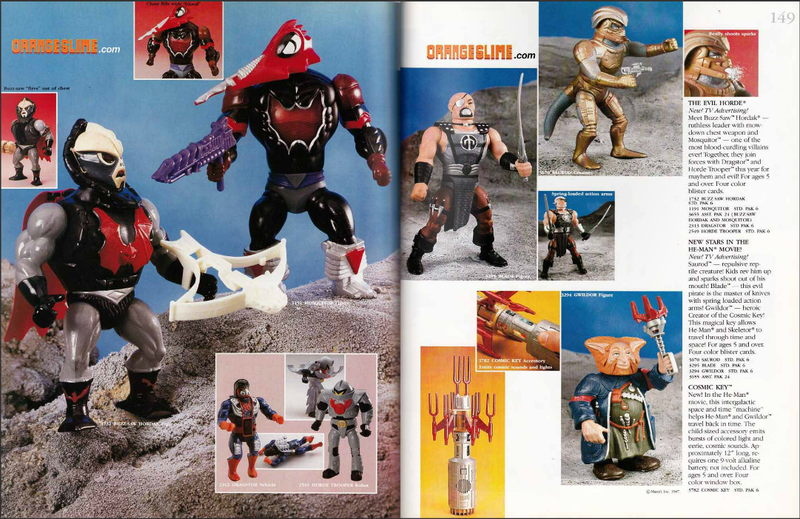 Occasionally though I would wander the isles of the toy store and see what was new in the world of He-Man. 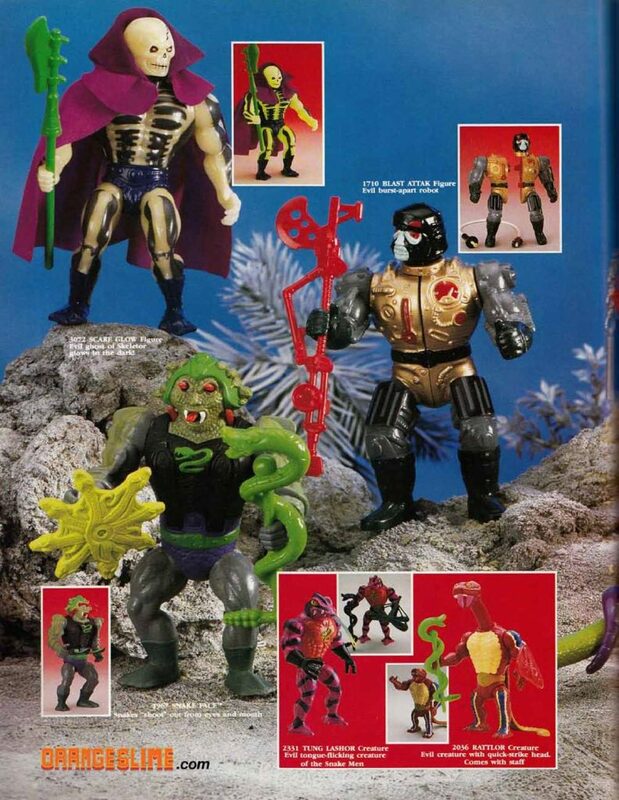 The three I remember best from 1987 were the Sorceress, King Randor, and Mosquitor. 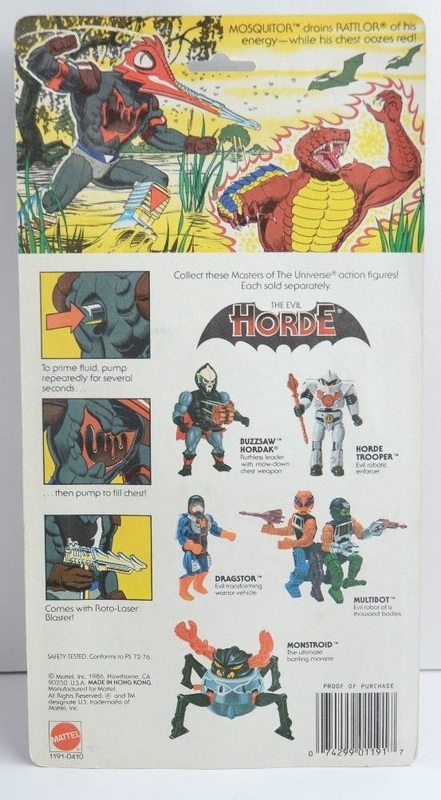 When the Evil Horde was introduced in 1985, it represented something of a revival for me in my interest in He-Man. The Horde was composed of some very creepy-looking villains, and they captured my imagination. 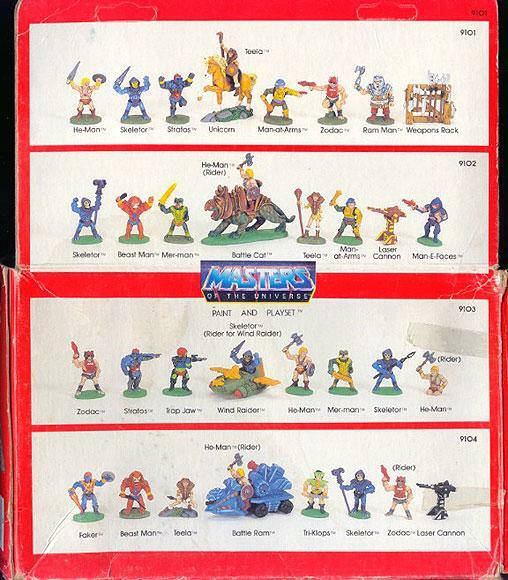 I owned Grizzlor, Leech, Mantenna, and Modulok, and spent quite a bit of time playing with them, even long after I had stopped collecting Masters of the Universe toys. 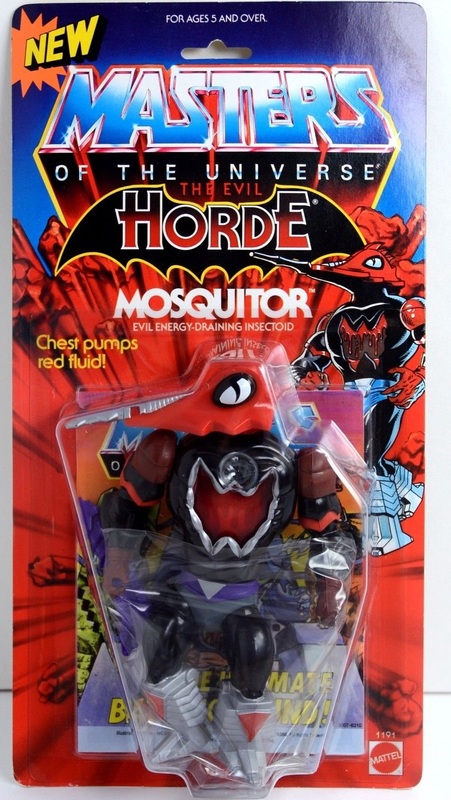 In my opinion, Mosquitor fits right in with the original Horde lineup. 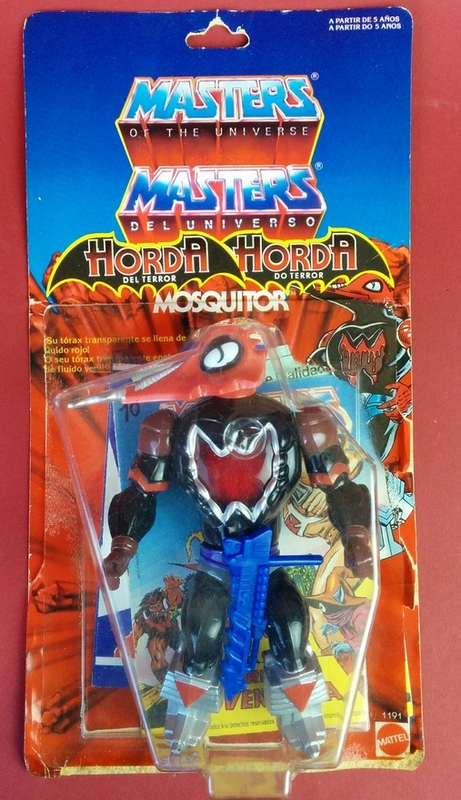 Mosquitor had quite a striking design and a bold black and red color scheme befitting his membership in the Evil Horde. 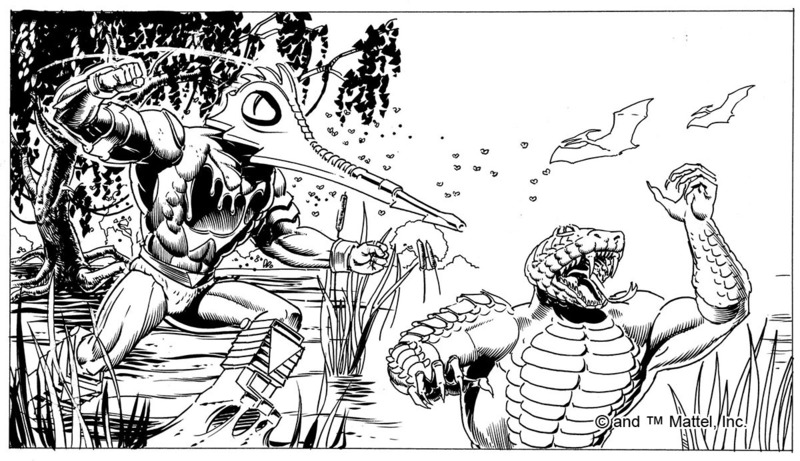 In fact, his head and especially his eyes bear a striking resemblance to Mantisaur, released the year before. 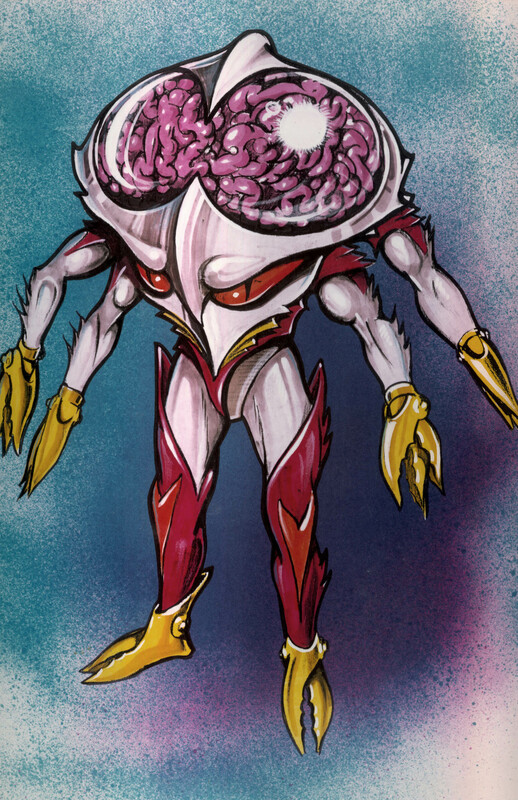 Mosquitor had a blood-pumping action feature that circulated blood inside his chest, causing the blood to drip down the clear screen on the front of his chest, only to be collected at the bottom and pushed around again to the top. 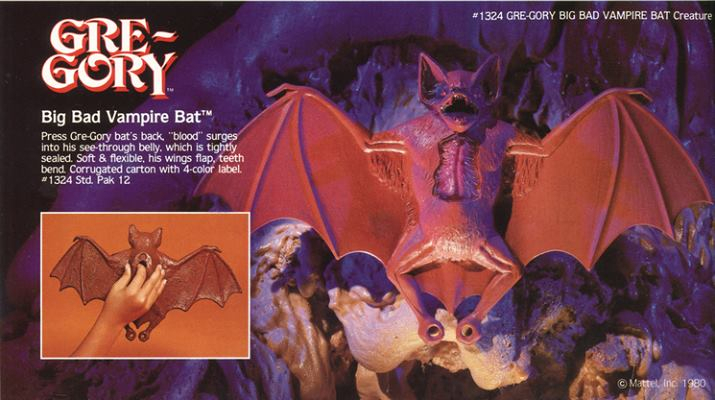 An early incarnation of this action feature appeared in Mattel’s 1980 Gre-Gory vampire bat. 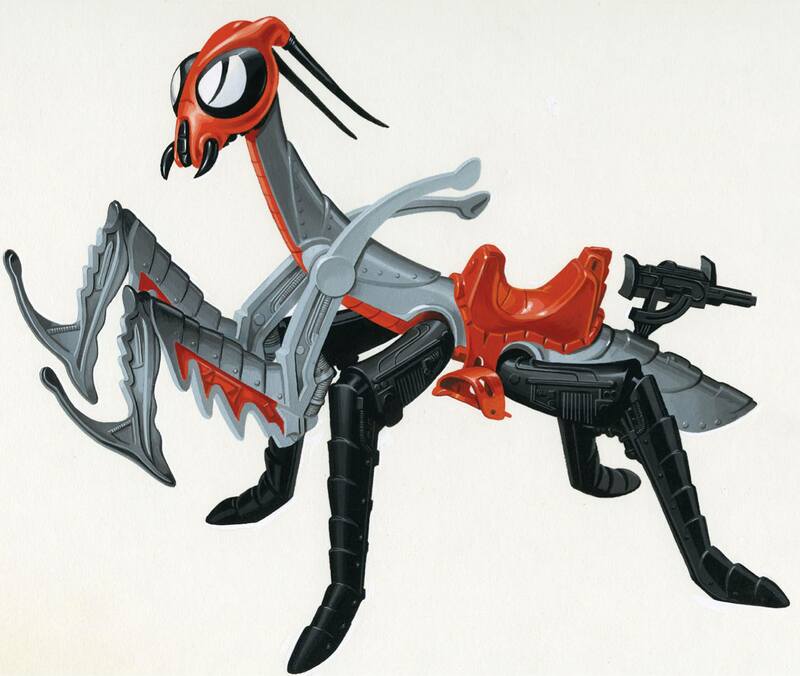 Some Top Toys-produced versions of Mosquitor have black “blood”. This was due to the factory making use of different pigments when they had run out of the standard red. 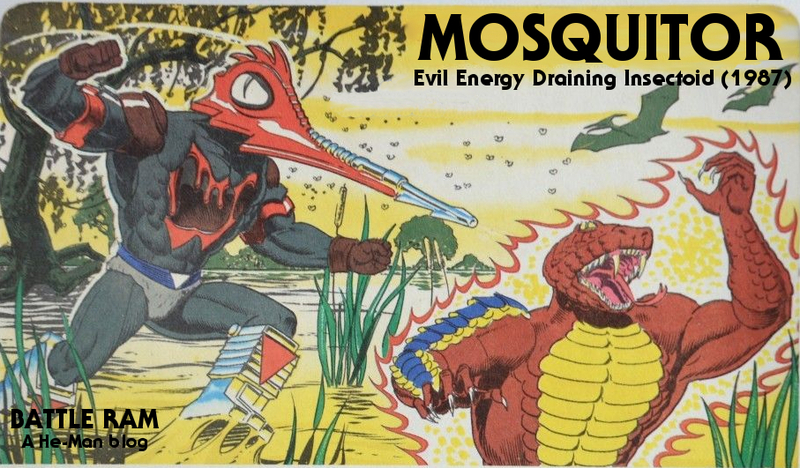 The front of Mosquitor’s card features a great illustration of the character. Given that Bruce Tim did several pieces like this for other characters released that year, I would guess he did this one as well. 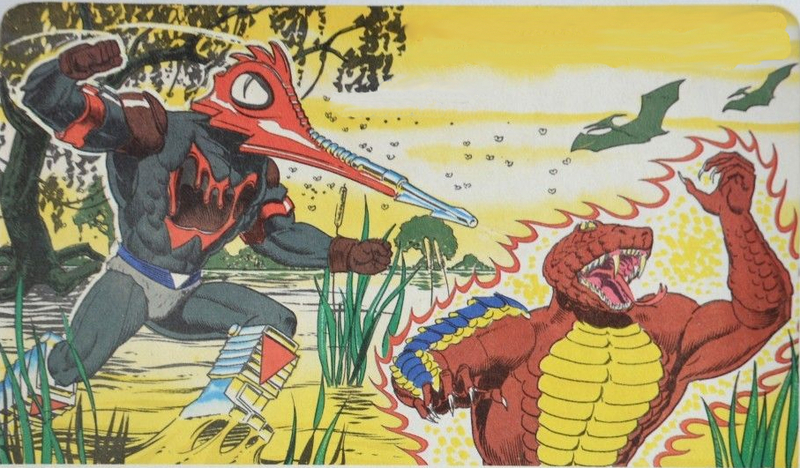 The back of the card features a great scene (artwork by Errol McCarthy) of Mosquitor assaulting Rattlor (somehow without directly contacting him), as well as some artwork demonstrating how his action feature works. 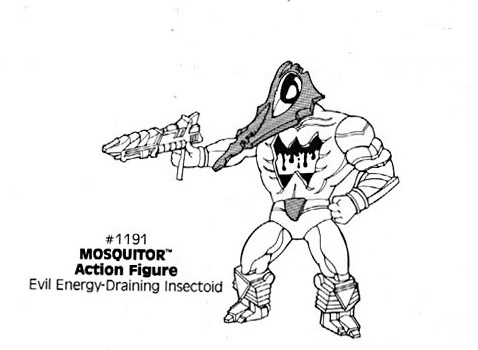 Given Mosquitor’s design, it’s obvious that he’s a blood sucker (like Leech before him), but I would guess that Mattel’s marketing department wanted to soften the gore factor and he is depicted as sucking “energy” instead. 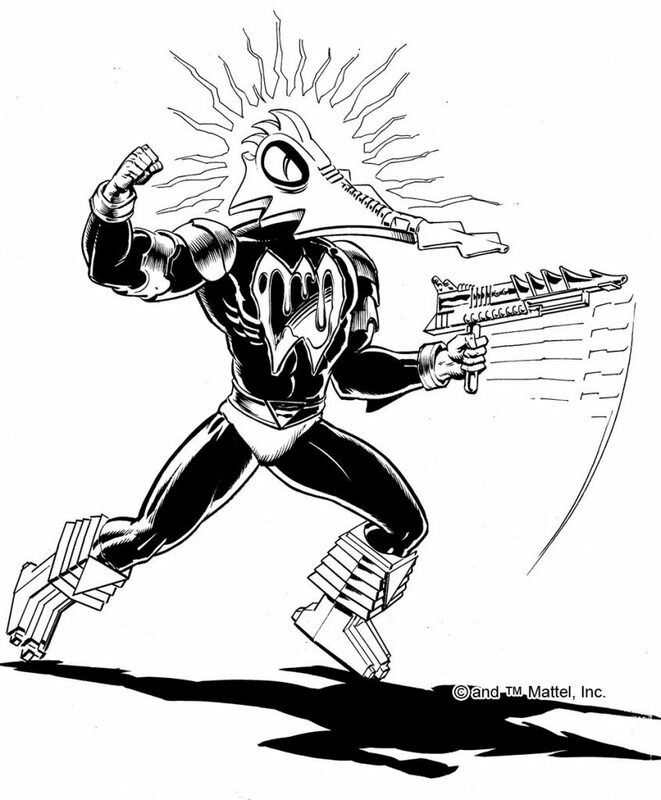 Notice that his “Roto-Laser Blaster” on the illustration below is silver rather than purple. 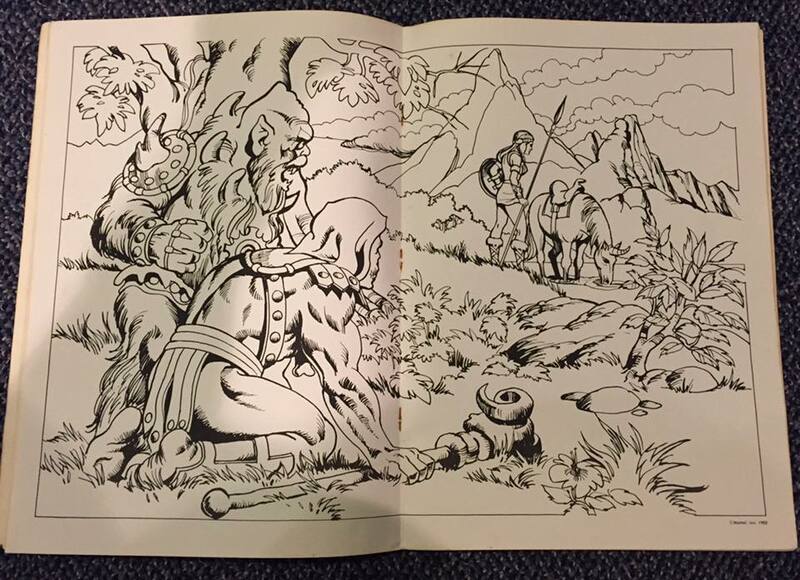 The 1983 Kid Stuff Masters of the Universe story record (written and produced by John Braden) is an interesting piece of intermediate MOTU canon. Its production predates the debut of the Filmation cartoon, and represents an intermediate step between pre and post-Filmation canon. The story seems to be informed by the Masters of the Universe Bible, written at the end of 1982 by Michael Halperin. The recording hasn’t been available in written form, so I’ve transcribed it here. 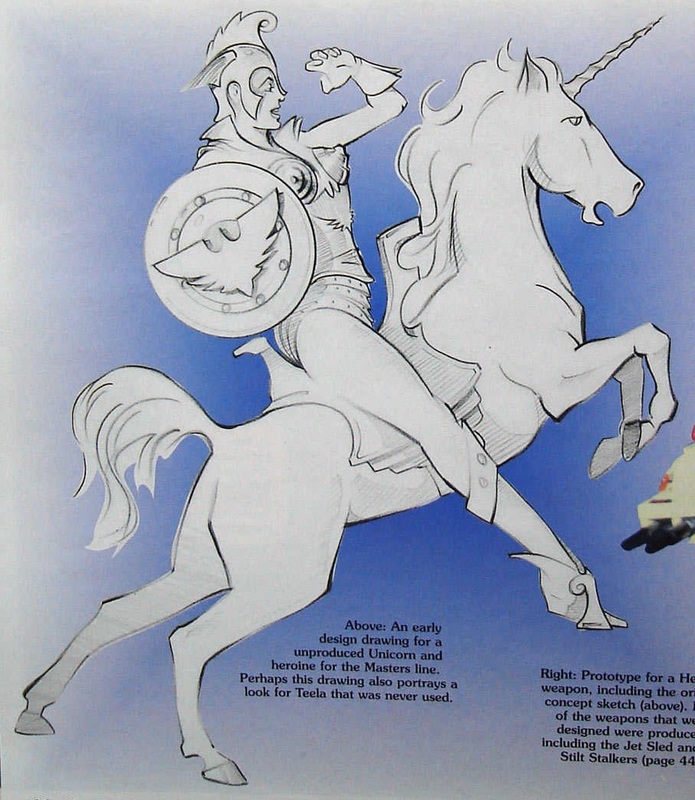 Prince Adam shouts, “By the power of Castle Grayskull” twice in order to transform into He-Man. 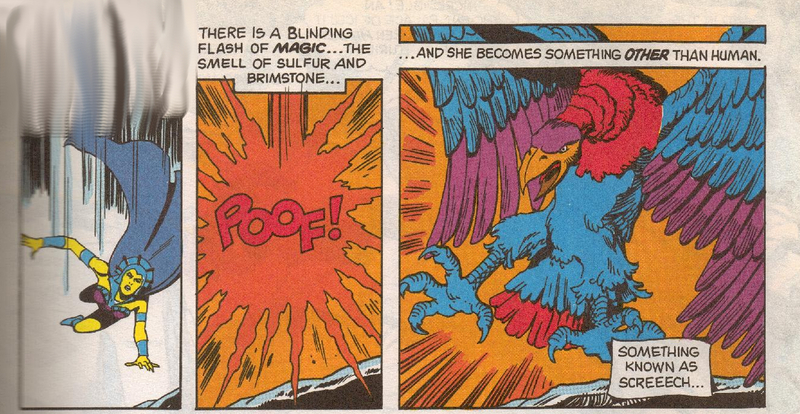 Evil-Lyn speaks in an old crone’s voice and transforms into Screeech. Screeech is a black vulture. 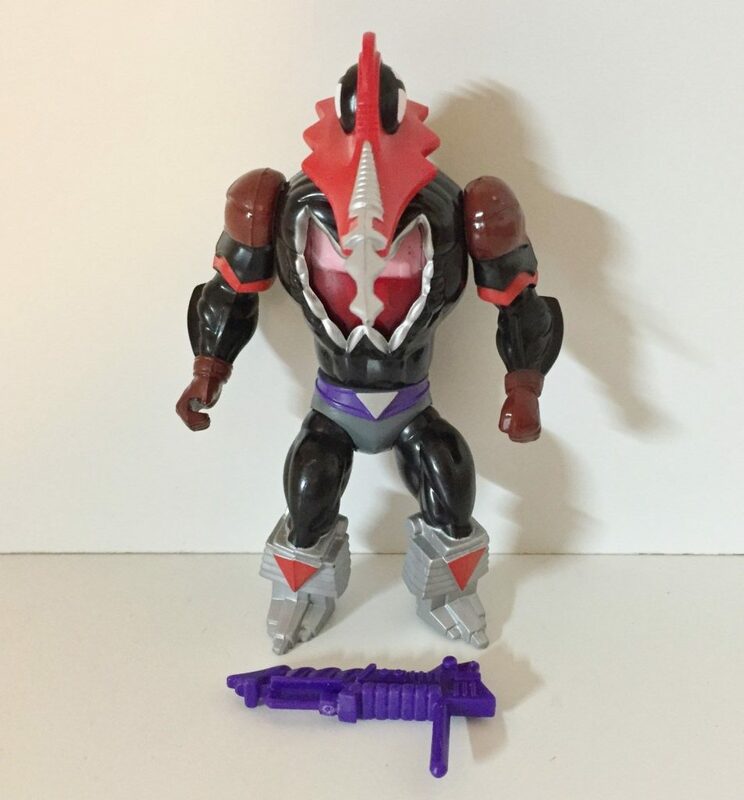 Panthor is black, not purple. 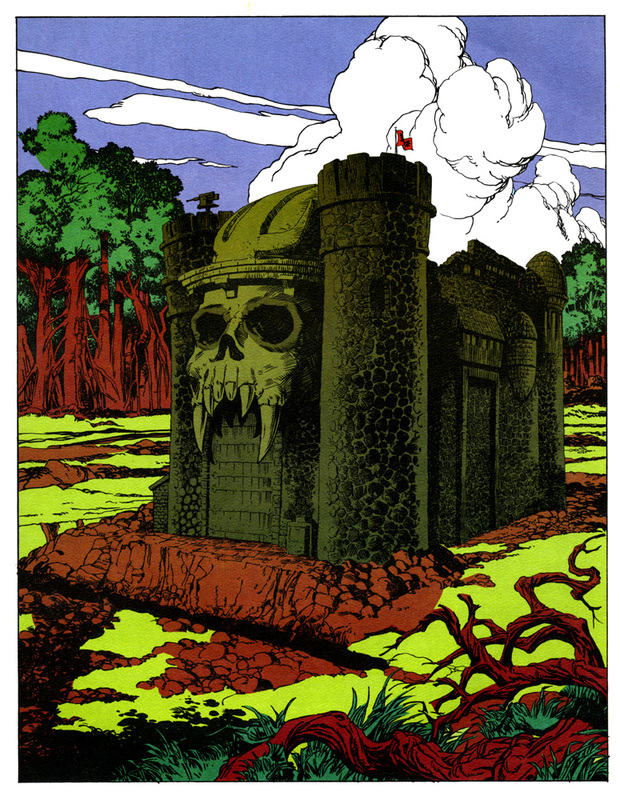 Castle Grayskull is located in the middle of a thick forest. 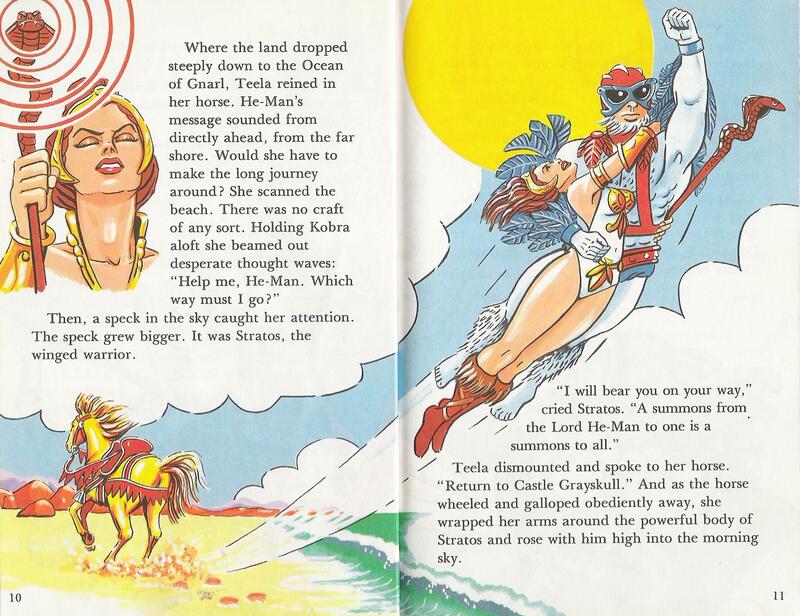 In order to make the read a little more interesting, I’ve added illustrations from various sources (most via He-Man.org or Bustatoons’ He-Man and She-Ra Blog), including other Kid Stuff story books. Far in the deepest reaches of space, hidden from view by the swirling gasses of trillion solar systems lies a world beyond all imagining. Here, spinning in the endless blackness of space, exists the planet Eternia. 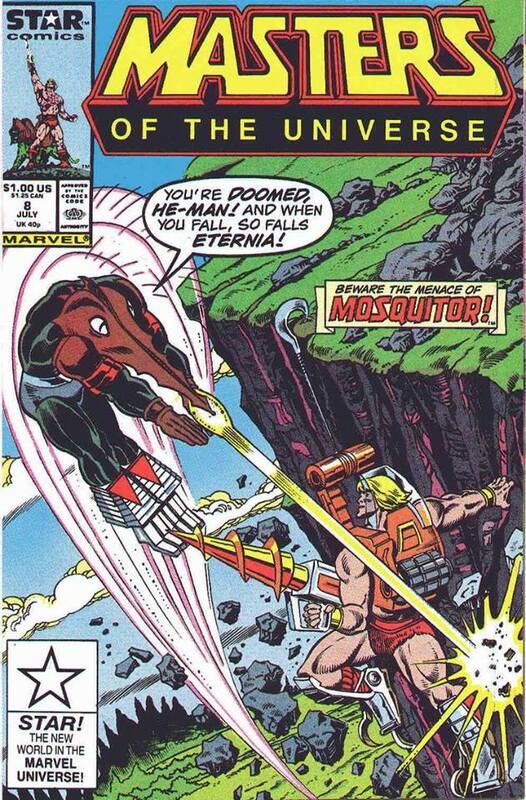 Eternia – even in the name you can hear the magic. The roar of the winds that whip their way through the rocky mountain tops. The crashing of the waves that cast themselves on the sandy shores of time on this mysterious world, tucked away in a forgotten corner of the universe. Eternia. The equatorial vine jungle whose steamy swamps swarm with gigantic serpents and twisted man-eating plants, whose roots dangle dangerously, waiting to trap and devour any foolhardy Intruder. 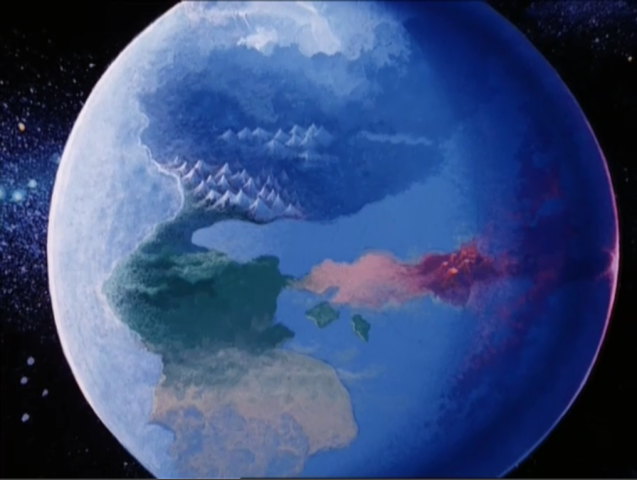 Eternia, where the evergreen forest towers, as immense trees reach upward toward the fleecy blue sky overhead. The thick ferny underbrush teems with countless strange creatures who have evolved into life forms much different than those on earth. Great winged lizards dangle by their scaly claws from the top-most branches of the pines, while deep within the mossy caves that line the cliffs, awesome dragons watch the world through beady green eyes and spew their sulfurous breath out into the morning chill. Eternia. The sprawling sands of time. A desert whose shifting dunes hide ruins of long past ages when great stone temples lined the streets of imperial cities. All gone now. Swallowed up and swept away by the constant changing sands. All that remain are a few crumbling monuments to tell the tale of a forgotten civilization that labored and perished in the unforgiving desert. 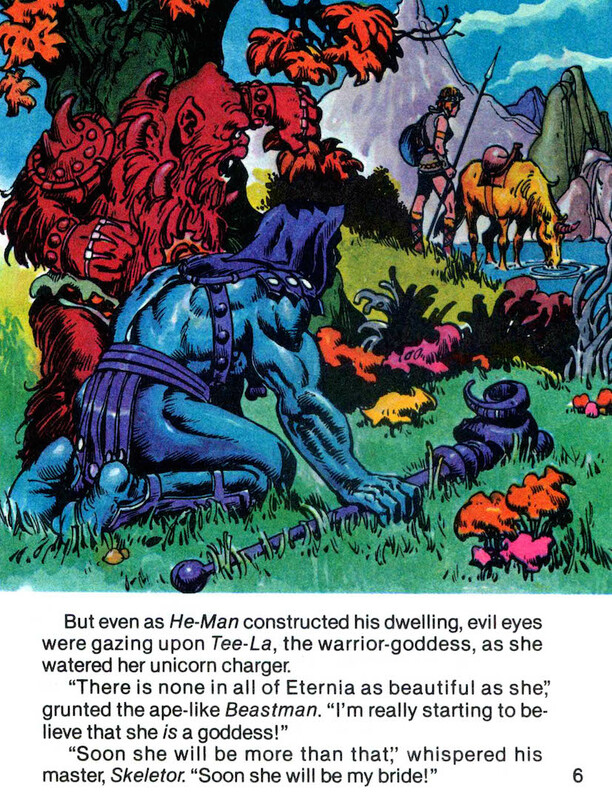 Eternia – a world of unimaginable beauty and unspeakable danger. For it is here, on this isolated planet, that one of the greatest battles between good and evil in the universe is being played out. 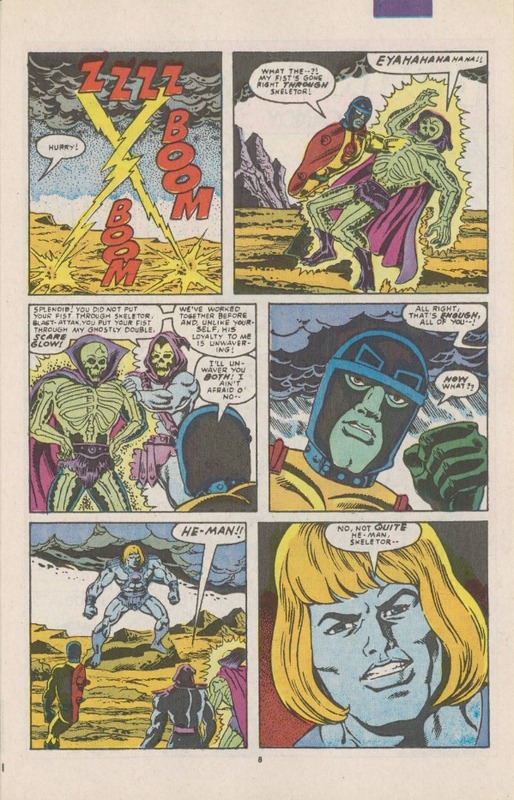 The monstrous Skeletor, a villain of unending cunning and wickedness, has escaped after years of isolation on his own planet, Infinita: and with a legion of demons at his side, threatens the safety and tranquility of Eternia. But Eternia has a protector. 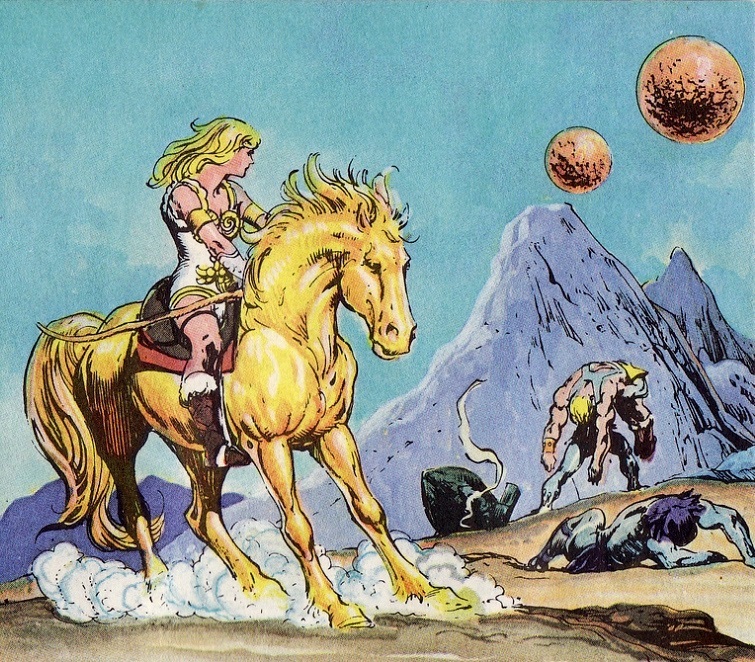 A hero foretold in legend and myth since the dawn of Eternian time. Centuries ago Eternia’s wise rulers, the Council of Elders, sensed that some time in the future, danger would descend on their planet. In one moment of incredible concentration, they compressed all their accumulated knowledge and wisdom about the universe into one omnipotent glowing orb of power. 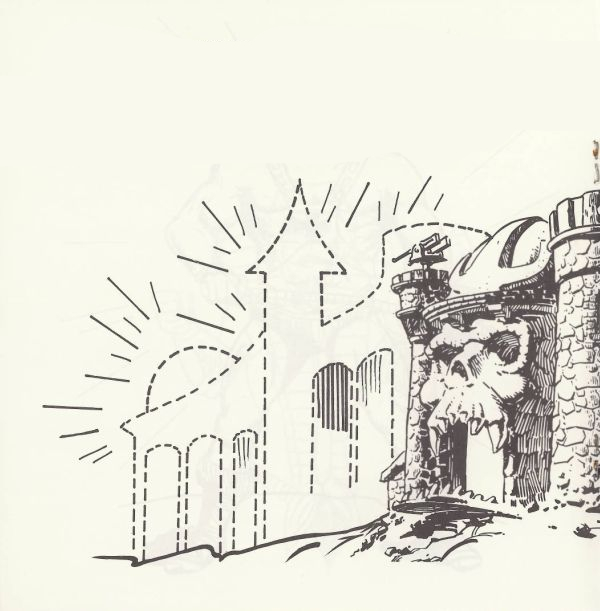 They transformed the center of their government, the lustrous hall of Wisdom, into a fearsome rocky castle with a stone face of a skull at its front. They placed the orb of light and wisdom deep in the musty dungeons of the castle, where it would be safe from the forces of evil. Over the thousands of years that followed, the thick evergreen forest swallowed up the frightful edifice, and it disappeared into memory and folk legend. But, to this very day, its name brings a chill of fear and awe. It is the mighty Castle Grayskull. And now, the evil warrior that the wise Council of Elders feared has arrived. Skeletor stalks the planet, searching for a way to seize control. But at every turn, his wickedness is checked by the heroic protector spoken of in the old tales. 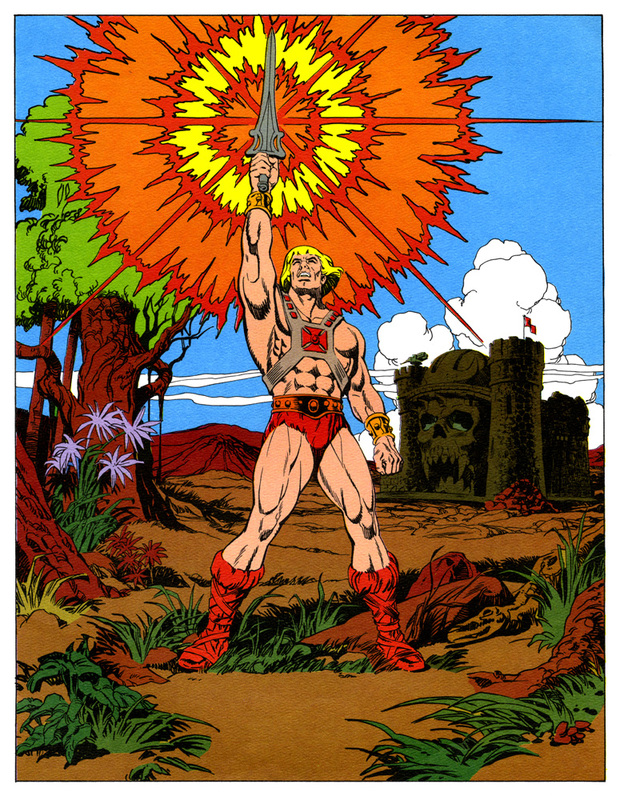 A giant of a man, with long golden hair and rippling muscles that gleam in the brilliant Eternian sunlight. This is He-Man. 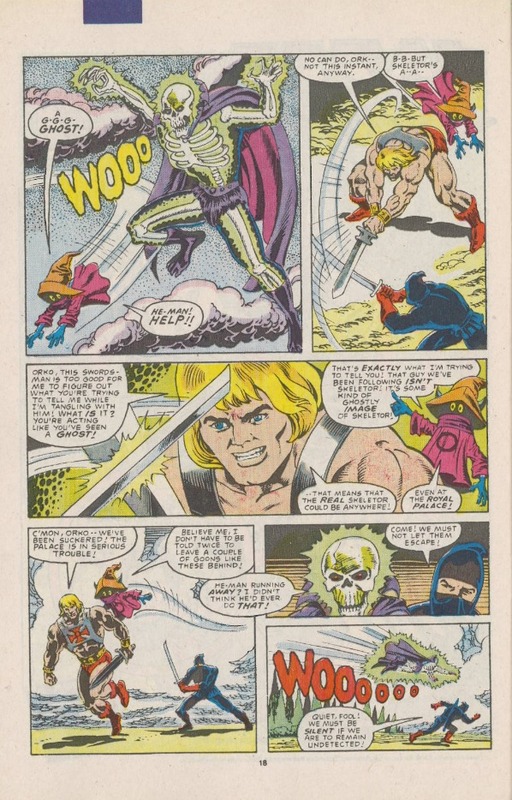 In order to protect his true identity and thus make it harder for Skeletor to destroy him, He-Man lives a double life as Prince Adam, playful son of King Randor and Queen Marlena. 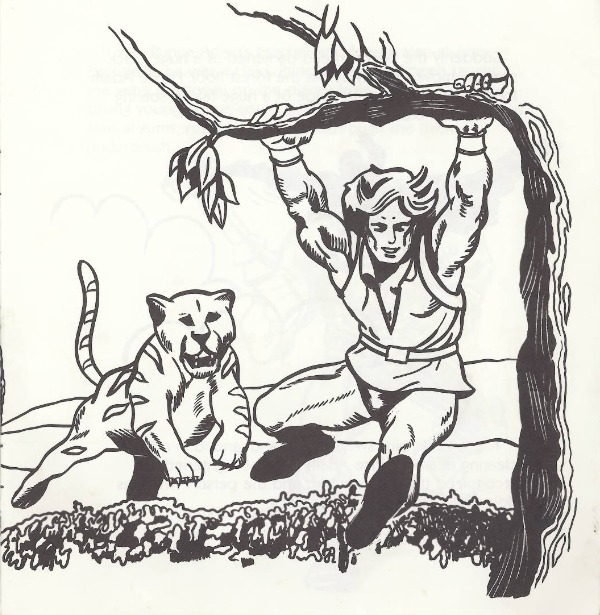 Even now, as we speak, Prince Adam is playing with his pet tiger, Cringer. 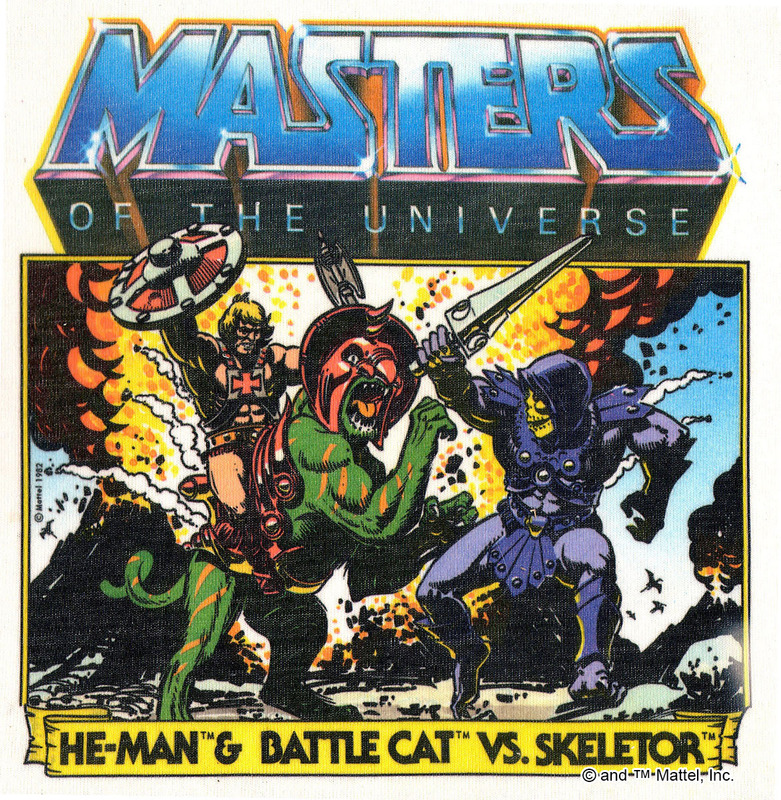 In the beautiful gardens that surround his father’s castle, he and his feline friend romp in the tall grass, happy and care-free, unaware that as He-Man, he is about to face the most difficult and dangerous challenge of his life – a life and death struggle with Skeletor. The outcome of which will determine the fate of the planet, and perhaps the entire universe. Prince Adam: Ha-ha, careful my furry friend. Your claws are sharp. Sometimes you do not realize your own strength. Here, I will toss this stick out on to the lawn, and you will find it and return it to me. Do you understand? Cringer growled with pleasure. He loved the long afternoons he and his master spent in games and fun. Adam hurled the wooden stick high into the air. It soared over the flower beds and landed far away in a bushy area at the very edge of the castle grounds. Sometimes Prince Adam didn’t realize his own strength either. Cringer charged away after the stick. Prince Adam: Good cat. Find it and bring it to me. Suddenly a huge black shadow swept across the green lawn. The warm afternoon air was stirred to a chill at the flapping overhead of two gigantic wings. Prince Adam gazed up into the cloudless sky and saw an amazing sight. It was Zoar, the falcon. The great winged bird whose wingspan was more than 20 yards across glided low, skimming the tops of the tall trees that surrounded the castle walls. And most amazing of all, on the falcon’s wide feathered back rode Man-At-Arms, Prince Adam’s teacher and companion. In a swooping arc the giant bird and its rider soared over the lawn and landed in a flurry just a few yards from the young prince. 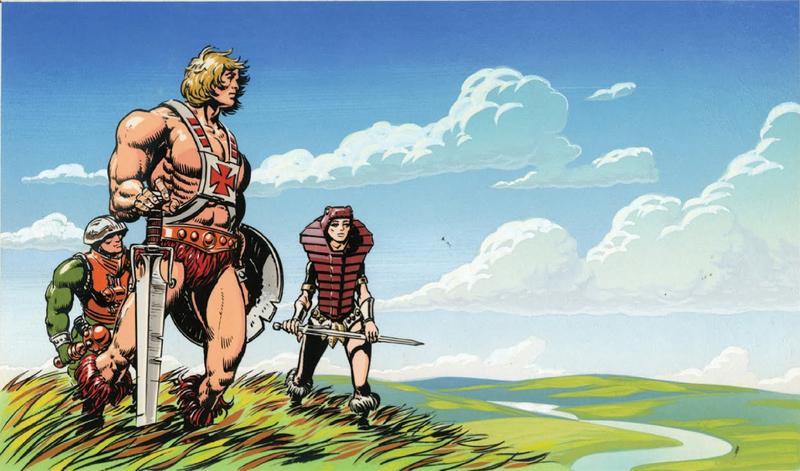 Man-At-Arms slid down along one of the gigantic wings as Prince Adam rushed to his side. Prince Adam: Greetings my friend, and greetings to Zoar the falcon too. I see concern on your brow, my teacher. 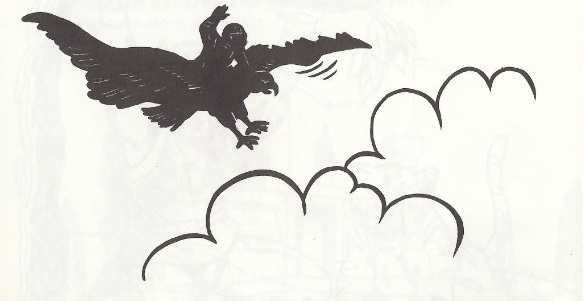 The enormous bird settled its mammoth wings by its side in a gust of wind as Man-At-Arms put his hand on Prince Adam’s mighty shoulder, and the two of them walked through the garden, talking. Man-At-Arms: I am afraid, sire, that I am not the bearer of good news. Prince Adam: This I sensed, my friend. Please tell me what is wrong. Man-At-Arms: There is trouble in the northlands my lord. The wicked Skeletor has found his way dangerously close to castle Grayskull. Man-At-Arms: It is worse than you think my prince. Skeletor has learned of the wisdom of the elders which is hidden deep inside castle Grayskull. 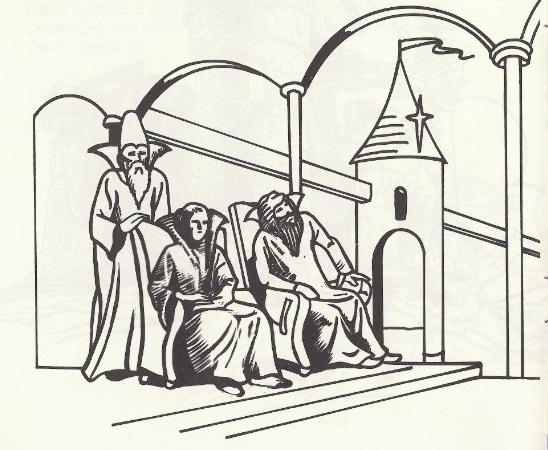 He has vowed by all that is unholy to break into the castle and gain control over the elders’ wisdom. Prince Adam: This must not be done! 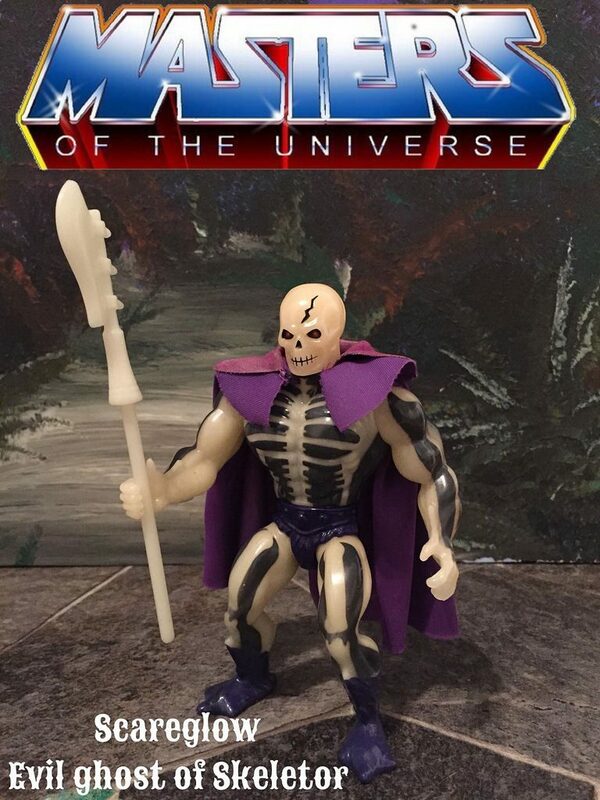 With this power Skeletor could easily rule all Eternia. His cruel leadership would plunge our world back thousands of years into the dark ages once more. All across the planet the light of hope and joy would be snuffed out by this fiend. He must, he will be stopped if it takes my last breath to do it. 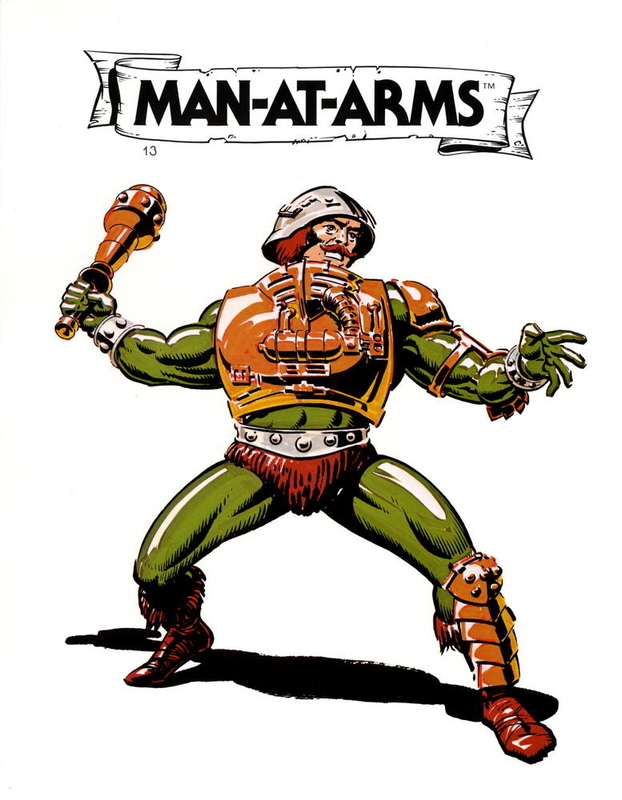 Man-At-Arms: I knew, my lord, that you would not let your people down. The fate of the planet rests on the outcome of this battle. In an instant Prince Adam reached down and grasped the sword which always hung by his side. He seized it in his strong hand and lifted it high overhead. It gleamed in the afternoon sun. 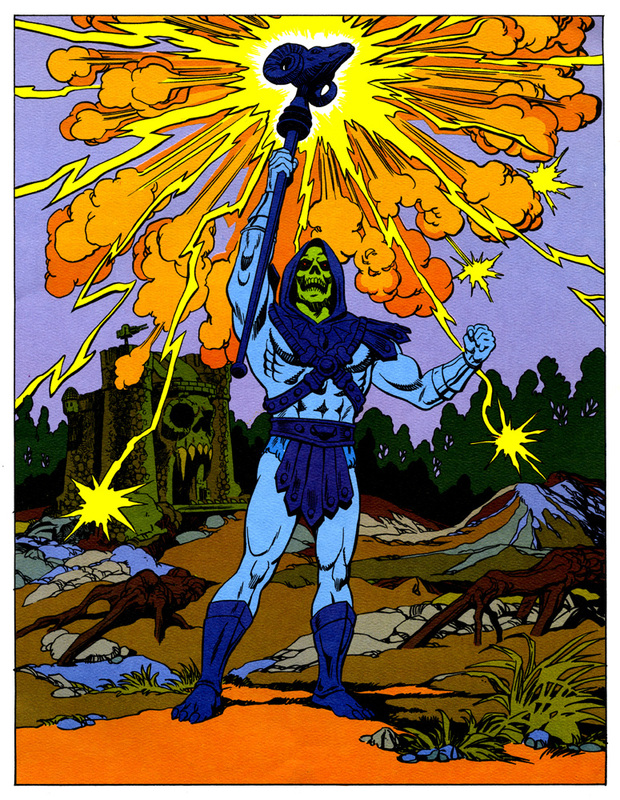 This was the sword of power, given to him by the Sorceress, protector of Castle Grayskull. 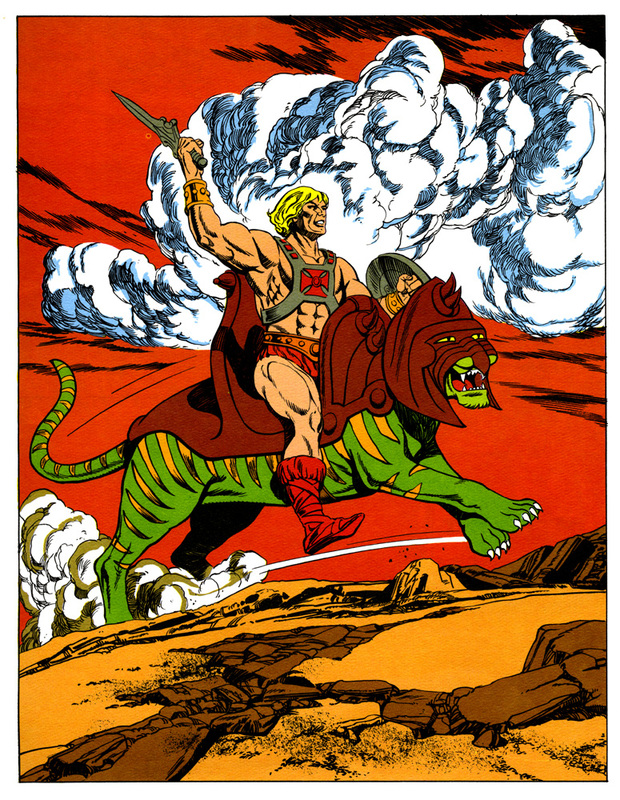 With this mighty weapon, Prince Adam could transform himself and his pet tiger Cringer into He-Man and Battle Cat, his armored mount. By his side stood Battle Cat. The power of Castle Grayskull had transformed Cringer into a fierce animal, a huge cat with green and yellow stripes and gigantic sharp claws and fangs. 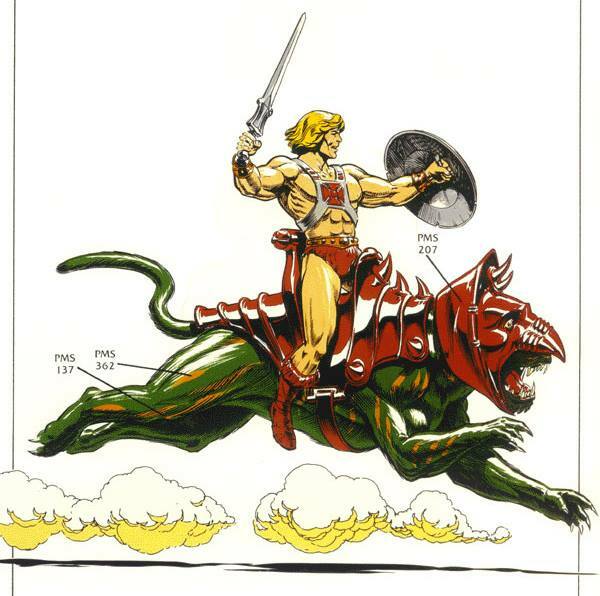 He-Man leaped up onto the enormous cat’s broad muscular back and with a shout, the two brave fighters charged off into the forest toward Castle Grayskull. 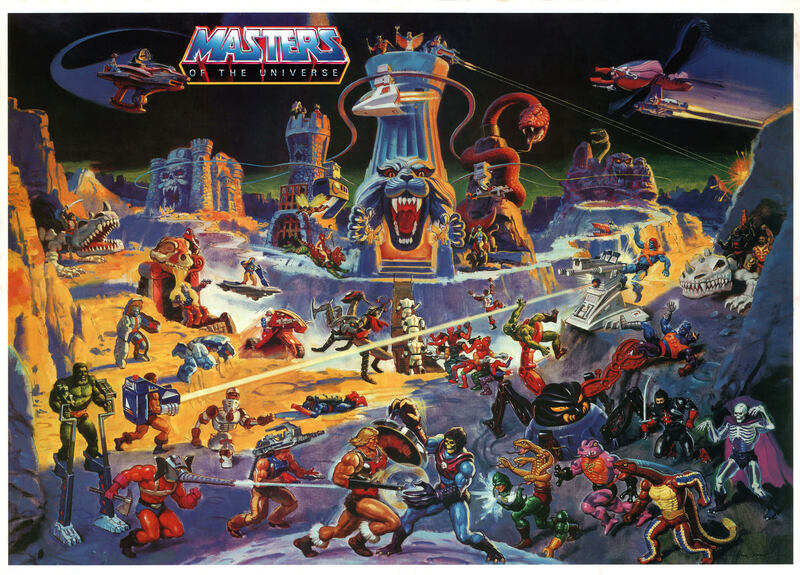 Meanwhile, on a rocky bluff overlooking Castle Grayskull, Skeletor and his wicked followers, Evil-Lyn, Beast Man and Tri-Klops gazed down at the view below. It was dusk and the setting Eternian sun cast strange twisted shadows as its last remaining rays filtered down through the ancient pines. 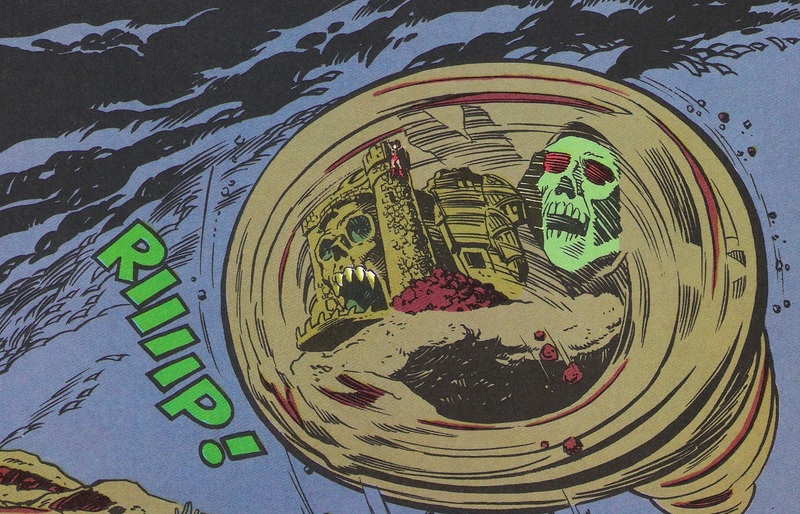 Far below Skeletor and his friends, rested Castle Grayskull. In the dim, half-light of sunset, the Castle glowed with an eerie green light that seemed to radiate from within the moss-covered stone walls. The eye-like windows of the skull faced castle stared out menacingly as if to warn any would be intruders to stay far away. A shroud of swirling fog was settling over the castle now. It wrapped its misty fingers around the castle towers and spiraled towards the damp earth. The castle’s entrance, the huge tooth-lined mouth of the skull, was sealed shut. Like the mouth of a long dead man, it knew many secrets but would speak none of them. Small leathery bats flapped their way out of the cracks in the castle walls and darted madly across the blackening sky. It was a sight that would fill most people with fear and disgust. 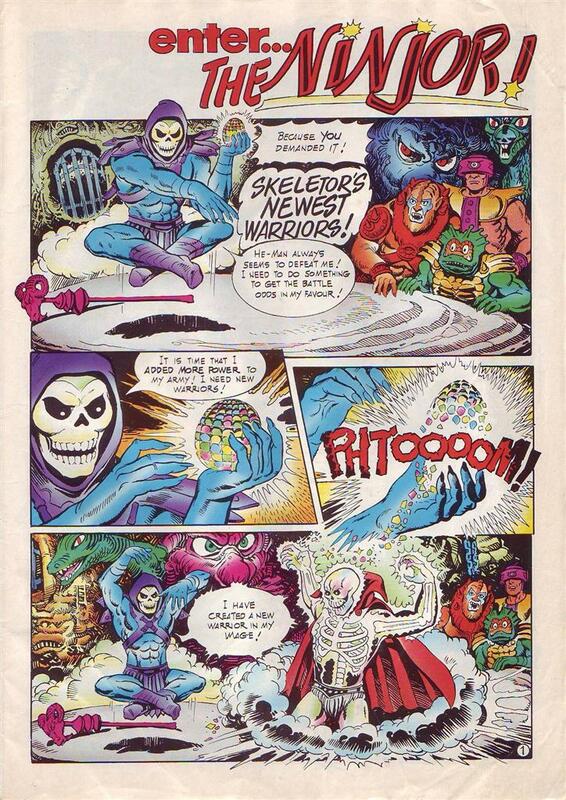 But it had just the opposite effect on Skeletor. The castle’s bony exterior mirrored his own skull face, and he gazed on admiration. Skeletor: Isn’t it beautiful? What a lovely sight. And to think, soon Castle Grayskull will be mine, all mine! Once I am inside the castle I will find the secret of Castle Grayskull, and the wisdom of the elders of this miserable planet will belong to me. Ha ha ha ha ha ha ha. 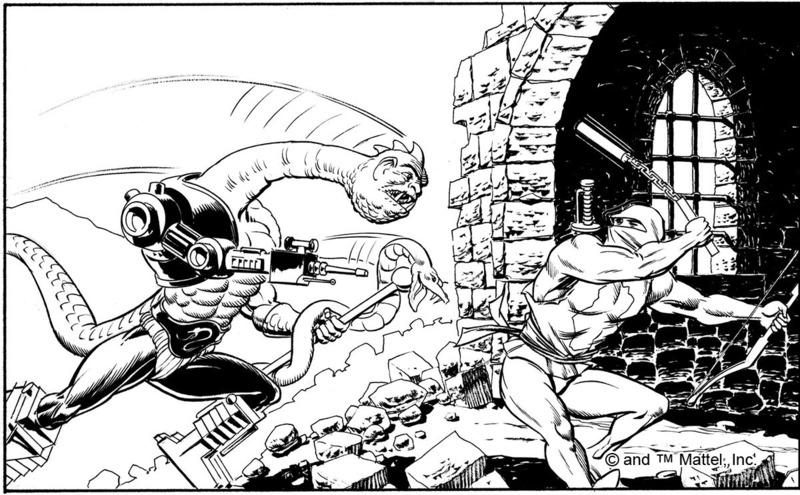 Of course, there is the small matter of the unavoidable fight between He-Man and me. But that is of little consequence. His puny power will prove to be no match for the power of evil I posses. By the time the sun sets another day, I, Skeletor, will be the supreme ruler of all Eternia. And Castle Grayskull will be mine! Mine! Mine! It is dawn on Eternia. As the morning sun creeps up above the craggy mystic mountains, it spills its warm life-giving light onto the dark and foggy valleys below. Small furry creatures stir in their holes. High in the pine trees creep birds stretch their stiff feathered wings while other birds, night predators, return home to their lairs in caves and hollow trees. Even the myriad strange plants that line the forest floor respond to the sun in a ballet of movement too slow to be seen by any eye. They unfurl tender new leaves and twist their faces toward the warmth of the rising sun. But, this morning, the peace and tranquility of the forest is shattered by a strange intruder. It is He-Man and Battle Cat. 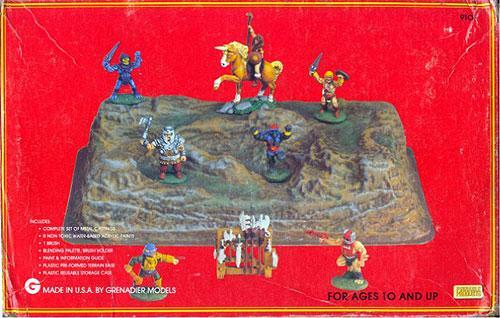 All through the long night they’ve raced on toward castle Grayskull determined to reach the castle before Skeletor can begin his attempt to enter the fortress. Battle Cat is fast as the wind, but can they reach the castle in time? Nearby, at Skeletor’s campsite, everyone is still sleeping. 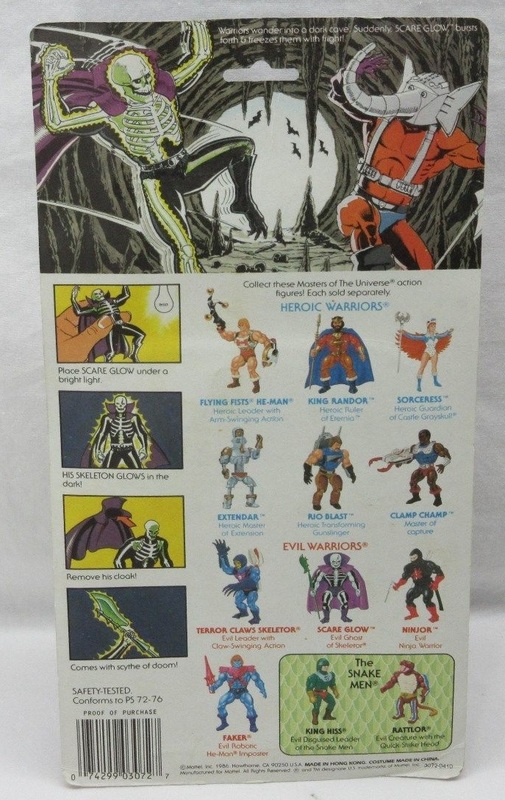 Everyone, that is, except Panthor, Skeletor’s mammoth black cat. Perhaps it is a scent carried along the wind, or the sound of the rustling bushes that has awakened the cat’s senses. The gigantic animal is anxious and paws at the ground nervously. He smells danger. Soon Skeletor opens his wicked eyes with a start and looks around. 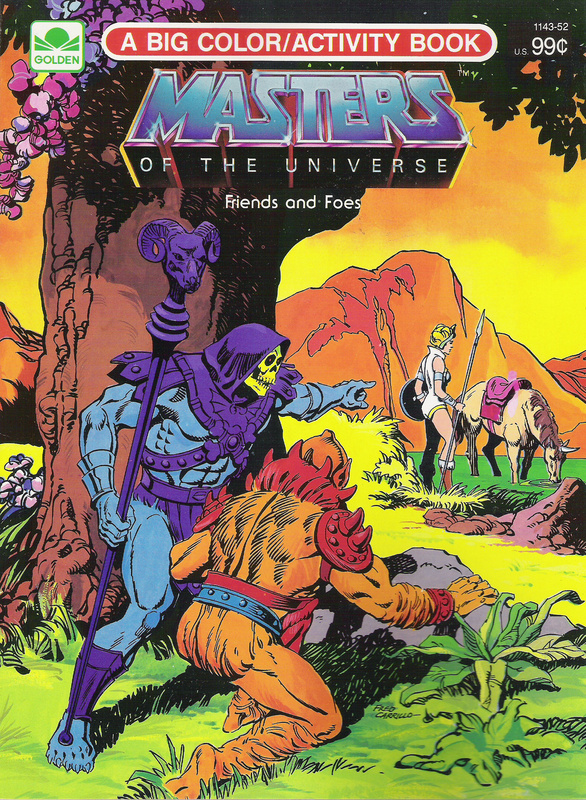 Skeletor: What is wrong, my good friend Panthor? Do you smell or hear something that we cannot sense yet? Up, up you lazy creatures! I have a feeling He-Man is drawing near. We must not let him catch us unprepared. 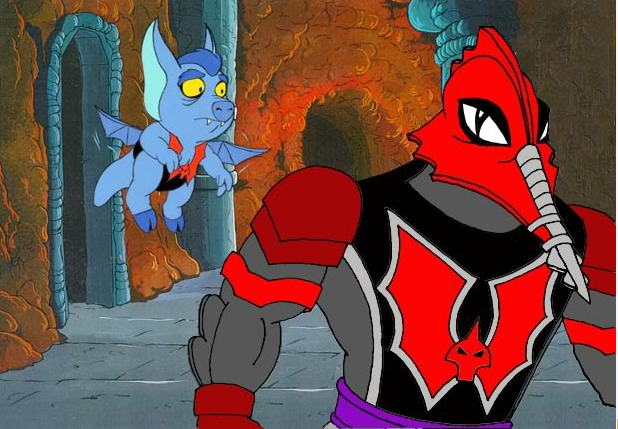 Soon, Tri-Klops, Beast Man and Evil-Lyn were awake and preparing themselves for battle. 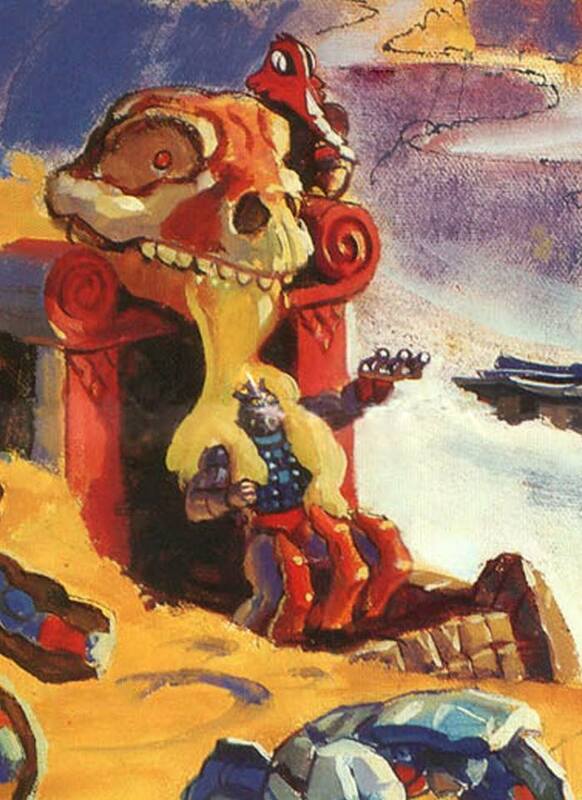 As they donned their armor, Skeletor gazed down on Castle Grayskull. Even the gleaming light of the morning sun could not erase the dark and foreboding shadows that clung to the castle walls. In the bright sunlight, Skeletor could appreciate the immense size of Castle Grayskull. Its towers reached skyward and the mammoth stones around its base dwarfed even the huge trees of the forest. From deep within the castle walls Skeletor thought he could hear a sound, softly at first, but growing slowly louder. It was a voice. No, not one voice but rather a chorus of voices speaking as one. The voices sounded anxious as if they sensed that something dark and horrible was waiting outside the castle walls. The sound grew louder until it reverberated thru the valley and rang with a fury in Skeletor’s ears. Skeletor and his friends made their way down the side of the rocky cliff toward the castle. The approach to the castle was hard. The path was old and clogged with thorny vines and bushes. Skeletor slashed at the underbrush with his sword and hacked his way onward. Soon they reached the entrance to Castle Grayskull. They all gathered around the raised drawbridge which was caked and crusty with age, and gazed up toward the parapets high above. The fortress seemed impenetrable. Skeletor: I have not come this far only to be stopped by a wall of stone. 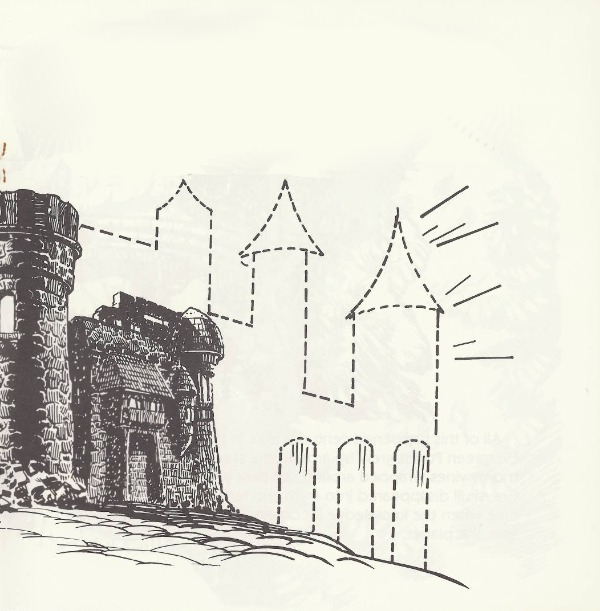 We must find a way inside this blasted castle. Her bird-like eyes grew wild with excitement. “Yar!” She closed the cape overhead and grumbled a strange, unintelligible chant. A pale green mist began to form about her. Soon she was glowing with a putrid light. A foul odor filled the air. When the fetid smoke cleared, Evil-Lyn was gone. In her place scratching at the ground was a hideous vulture. It was Screeech, the alter ego of Evil-Lyn. The filthy bird had a plan. She would fly up to the top of the castle and see if she could gain entrance through one of the eye socket windows. With a dreadful screeching sound, the repulsive bird flapped its feathered wings and lurched skyward. He-Man: Look, Battle Cat, do you see what I see? There by the castle tower. That ugly black bird is circling the parapet trying to get inside. By the power of Zodac, I’m sure that is Evil-Lyn, a companion of Skeletor. We must hurry. I just hope we are not too late to save the castle from this foul intruder. He-Man and Battle Cat charged onward thru the tall bushes. The giant cat leaped high in the air, covering enormous distance with a single bound. 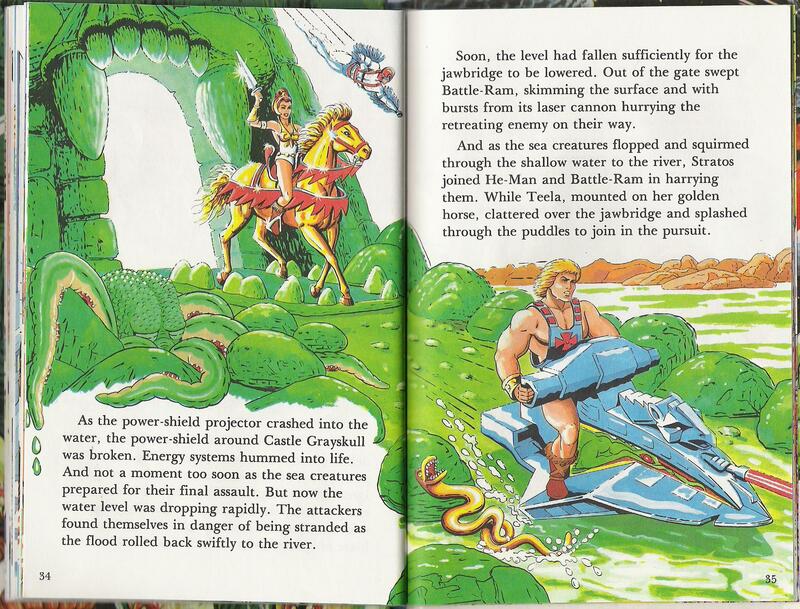 Soon He-Man and Battle Cat arrived at a clearing right outside the castle. He-Man: Unholy heathens! How dare you try and enter Castle Grayskull. 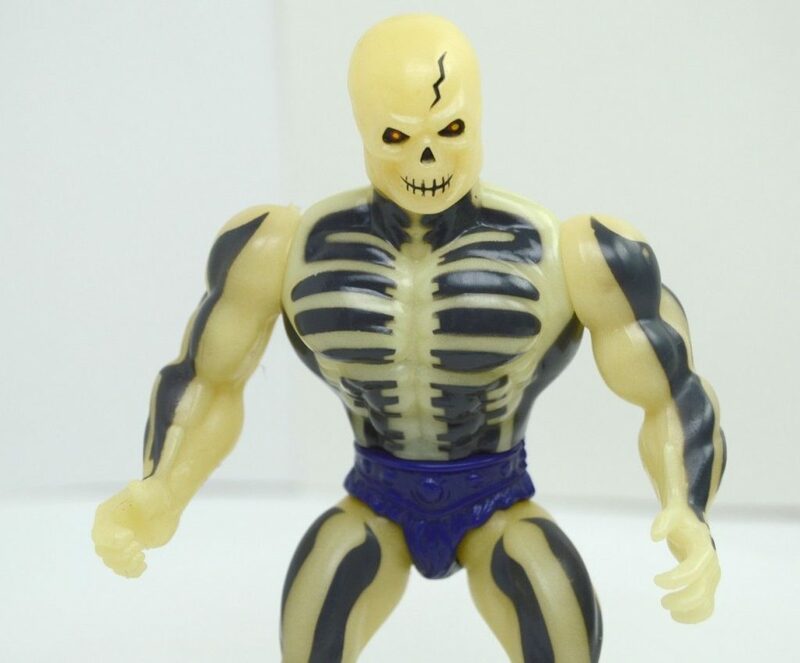 Skeletor, you boney coward! Prepare to fight! 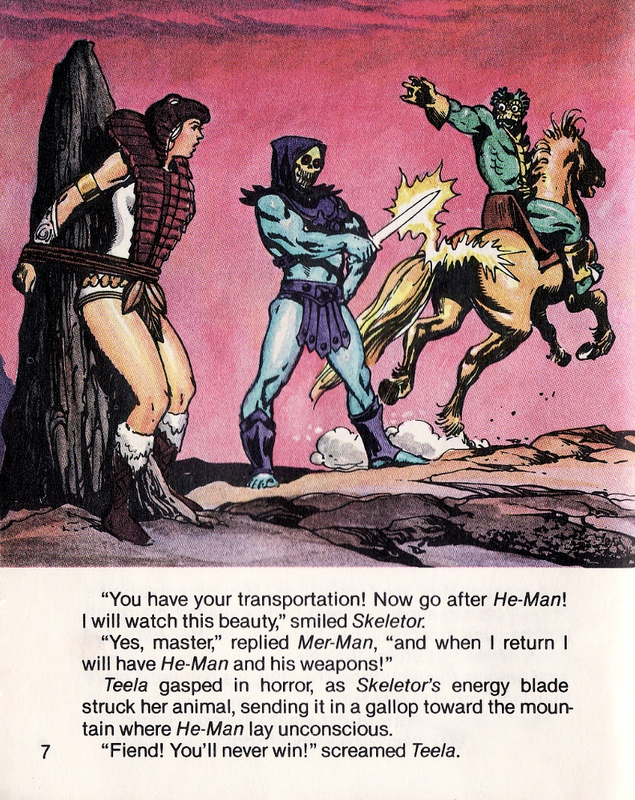 Skeletor: Well, well, if it isn’t He-Man, the pure and puny. We have been expecting you, haven’t we my friends? How I have looked forward to this day. Finally, a chance to put your fabled strength to the test. 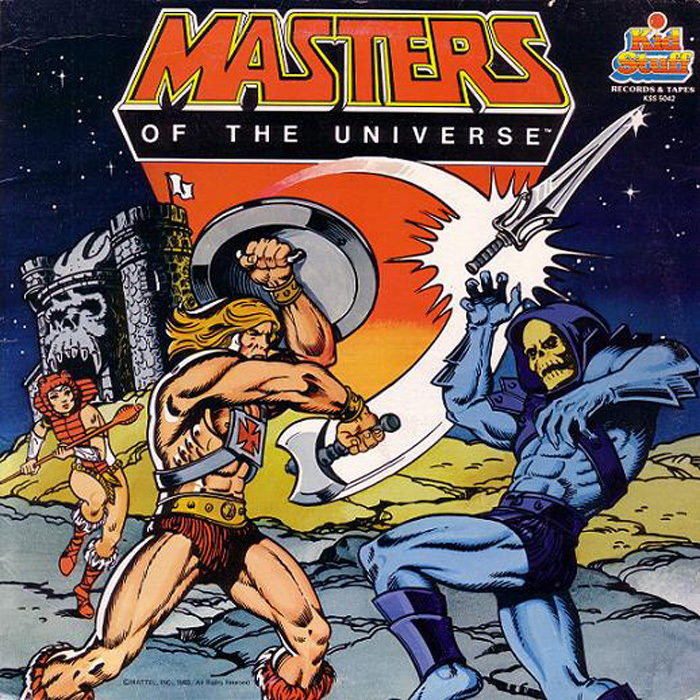 He-Man: You are eloquent, my fiendish enemy, but you fail to understand the true nature of the universe. While it is true that night time devours the day, it is doubly true that every morning the sun returns to frighten away the cowardly darkness. Just like the darkness of midnight, you are doomed by time and fate, Skeletor. Darkness has no power here. Be gone! Skeletor: Ha ha ha! We shall soon see who has the power in the universe. Enough talking. I grow impatient with your idle words. It is time to fight. He-Man: I would prefer not to engage in violence, but I see now that it is the only language you understand. So, we will fight. By the power of Castle Grayskull! 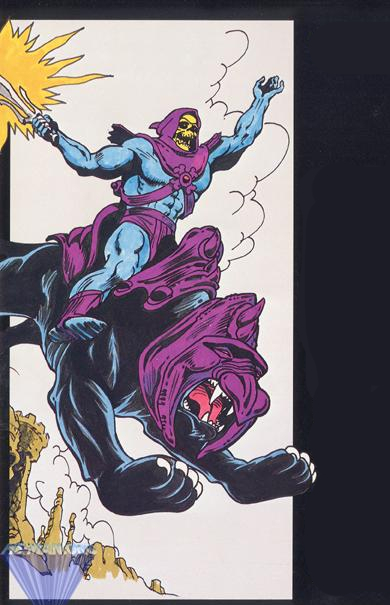 Skeletor jumped up onto the mighty back of Panthor and drew his sharp sword. 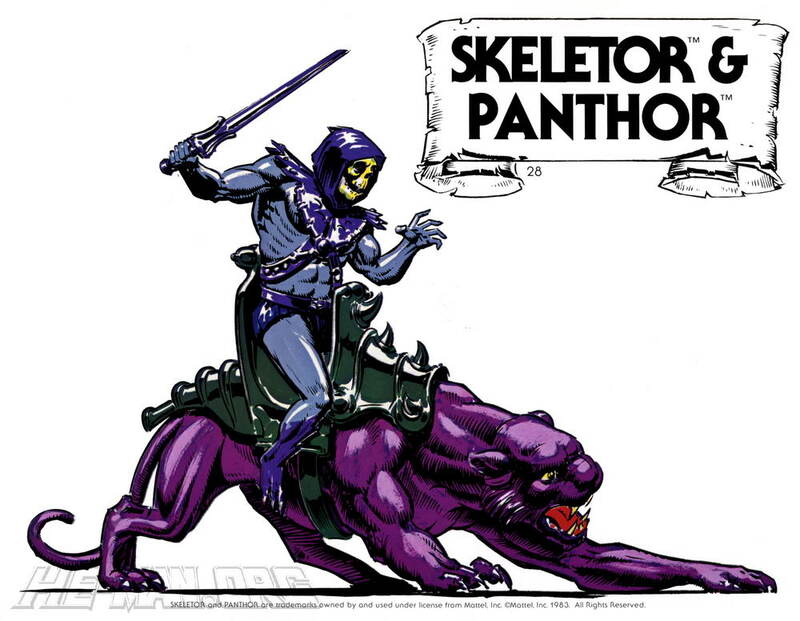 Skeletor: To battle, Panthor. The enemy is upon us! Attack! Attack! Battle Cat roared into action. He reared up on his hind legs and let out a terrifying growl. As the two arch enemies charged across the stony ground toward conflict, He-Man had drawn the sword of power, and it gleamed in the dazzling sunlight. Soon they were upon each other in battle. The clash and clatter of sword against sword rang out across the battle field. Tri-Klops and Beast Man stood by and watched in awe as the two giants fought furiously. Suddenly, down from the sky flew Screeech. 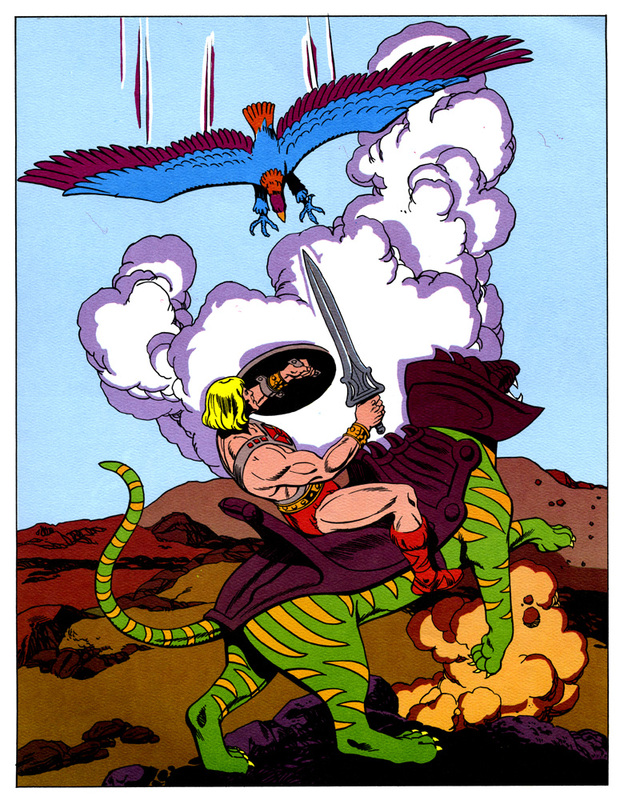 The savage vulture caught He-Man by surprise and in an instant knocked the sword of power from his hand. In a split second He-Man was struck with a bolt of energy from the sword of Skeletor, and he crashed to the ground in a cloud of dust. Skeletor: So light always triumphs over darkness does it? We shall soon see about that. You are defeated He-Man. You are powerless without that sword. 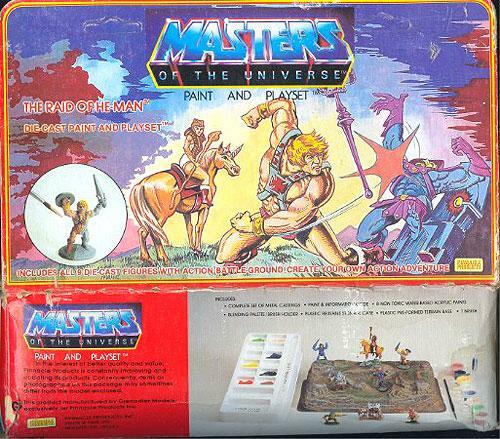 He-Man lay on the ground, stunned and silent. Could this really be happening? Could he actually lose the battle to Skeletor? Then he heard the sound. Softly at first, like a ringing in his ears. Whispering voices. But what were they saying? Council of Elders: Vortex! Vortex! On the verge of unconsciousness, He-Man strained to understand the voices. 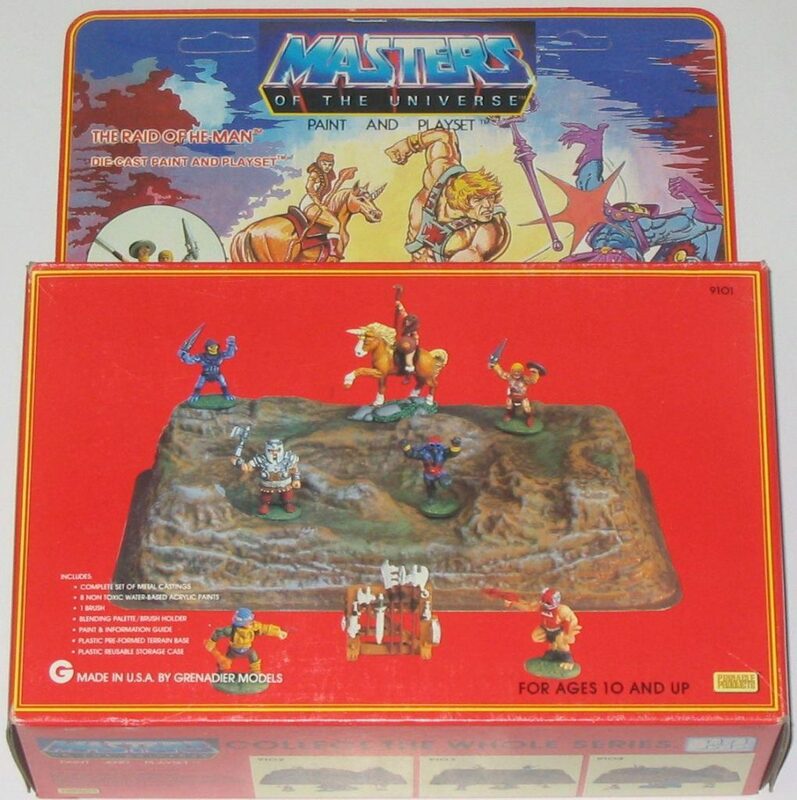 He-Man staggered to his feet. He understood now. All across Eternia there are time vortexes. Mostly they are concentrated in the Sands of Time Desert, but here and there all over the planet there are these strange vacuums of empty space. 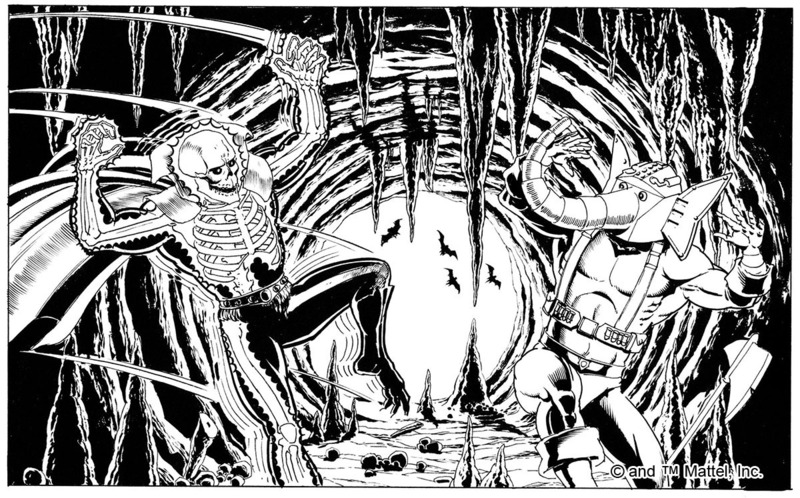 Like tunnels through time, they lead back far into Eternia’s history. Anyone who stumbles into one of these holes in time will tumble backward for endless centuries. 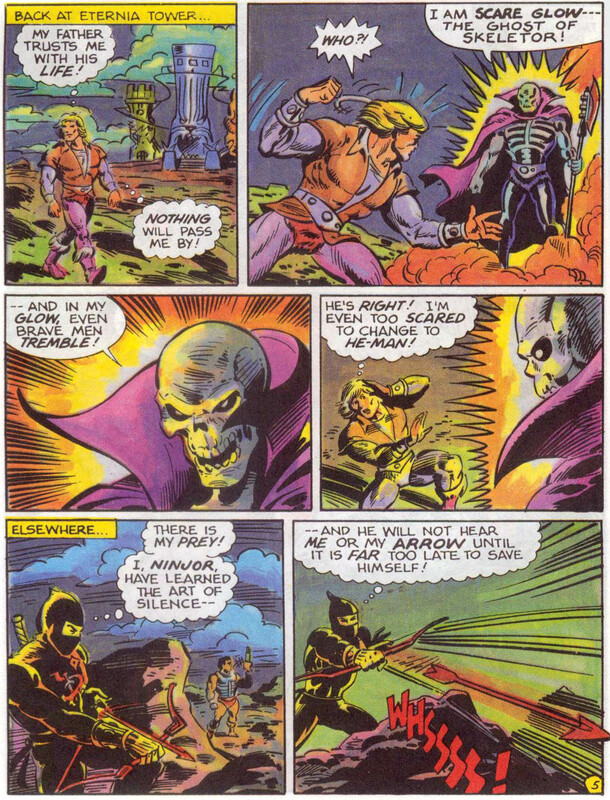 Skeletor: With pleasure, He-Man. I love the hunt as much as the kill. 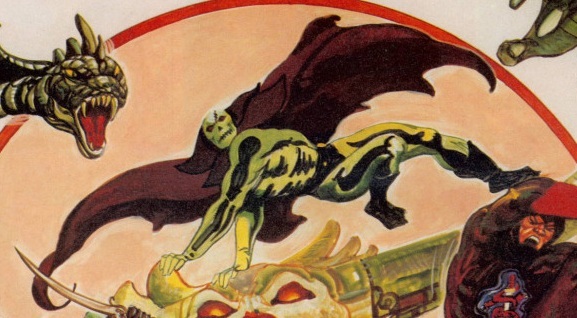 Come my friends, join me on Panthor. We will chase the cowardly He-Man for sport! What fun! 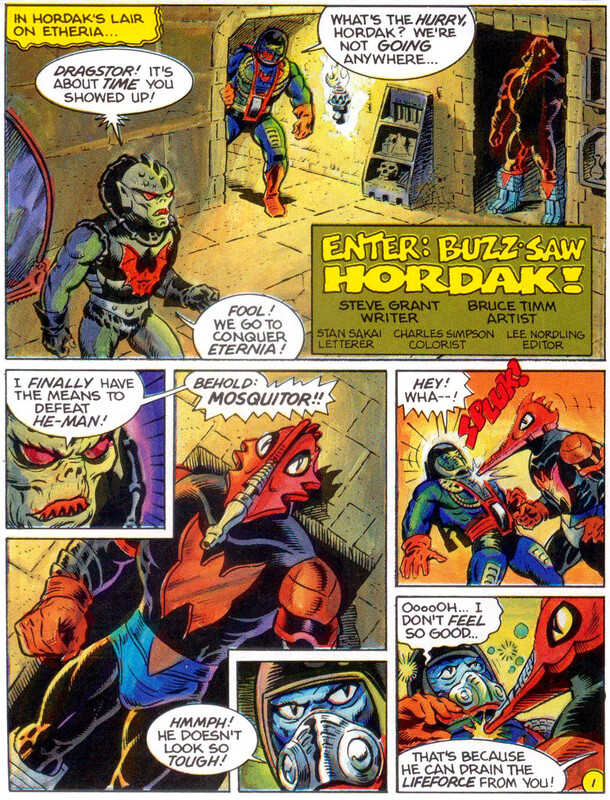 Beast Man, Tri-Klops and the vulture Evil-Lyn boarded Panthor, and the monstrous cat charged after He-Man. 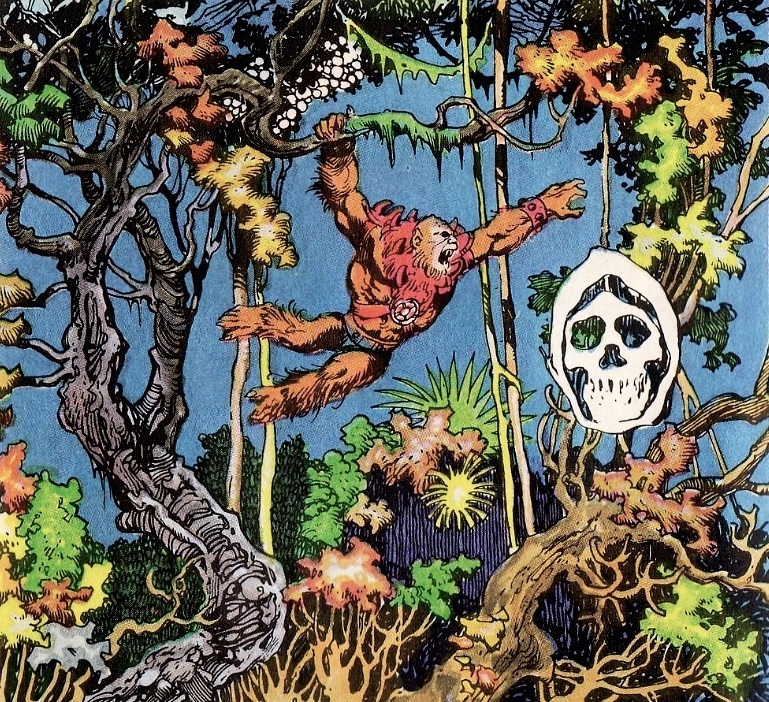 He-Man darted back and forth, leaping high onto rocks, and behind thick bushes. 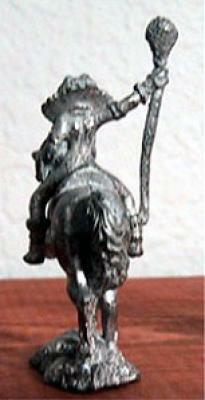 He was amazingly agile of foot, and soon Panthor was dizzy from the constant turning and spinning. Again He-Man heard the voices. Council of Elders: Over here! Trick him over here! Into the vortex. But be careful. The vortex will capture you too, if you misjudge the distance. Be brave! Be brave! The entire planet is counting on your skill. 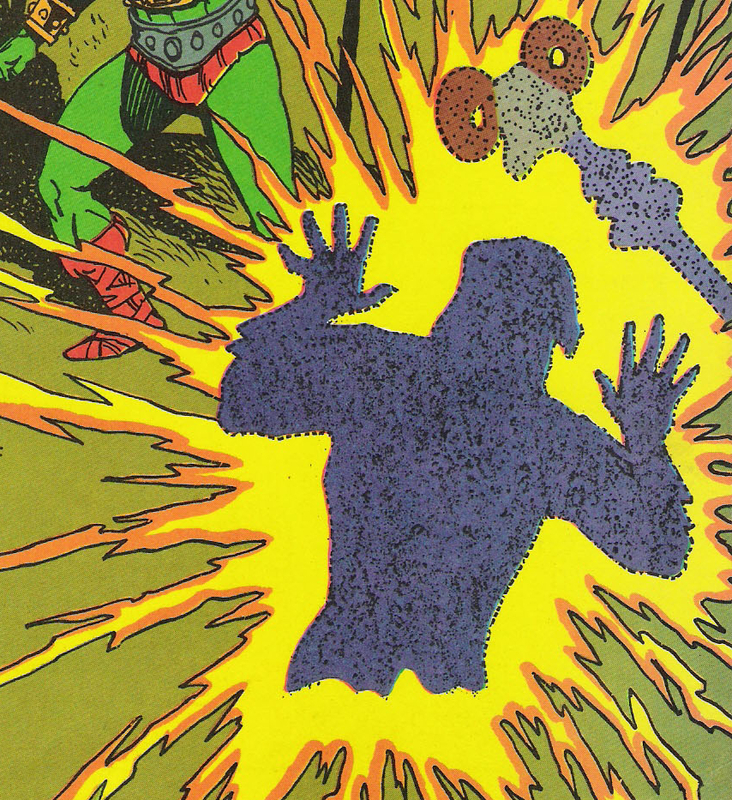 He-Man staggered toward the spot where the vortex swirled invisibly. Once he was sure of the exact location, he stood a few feet in front of it and shouted tauntingly to Skeletor. He-Man: All right you bag of bones, I’m tired of playing with you. I will tear you limb from limb with my bare hands. I await you! Come to me, you coward! Skeletor: You die, you fool. You die! He-Man stood courageously. Behind him he could feel the time vortex swirling into infinity. One false move and he would tumble backward into the past and Skeletor would conquer all of Eternia. The mammoth black cat was almost upon him now. 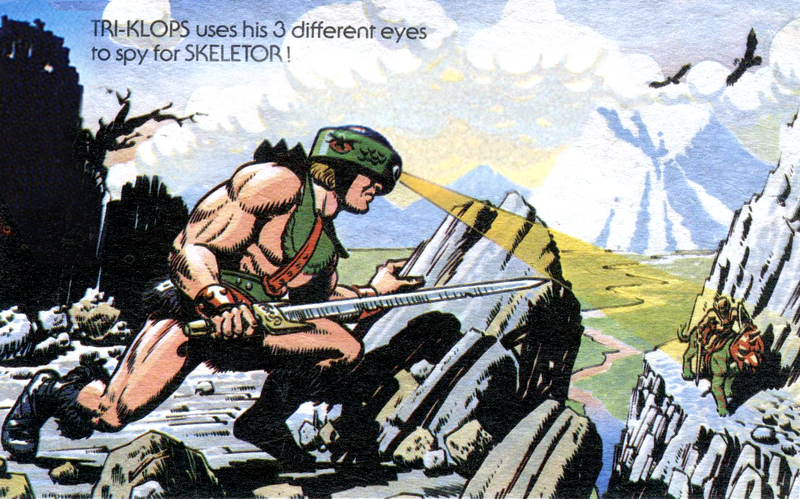 He could see the wild glow in Skeletor’s eyes. Then, as quickly as a fox, he jumped to one side. Skeletor and his minions were unable to stop or turn. They crashed head first into the vortex. Skeletor: By all the devils, what is happening? 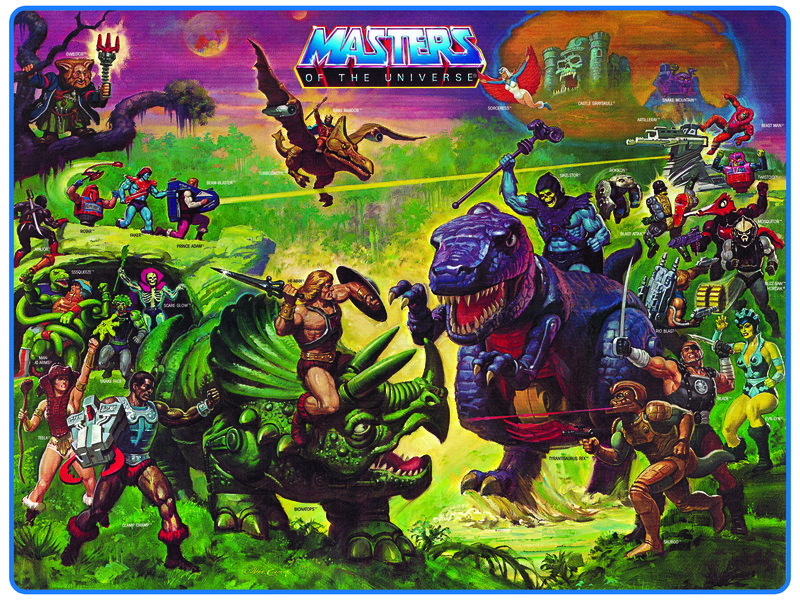 He-Man looked on in wonder as right before his eyes, Skeletor, Panthor, Evil-Lyn, Tri-Klops and Beast Man began to sparkle in the sunlight. They had fallen into the time vortex. Every molecule of their bodies was spinning madly off course and flickering on and off light a firefly. They were growing invisible. Skeletor: Help us! Help please! Don’t let us die! He-Man: You will not die Skeletor. You have been trapped in a time vortex. It will carry you far away from here to another time, far in the past. Perhaps for a while we here on Eternia will be safe from your tyranny. Farewell Skeletor! Farewell! Skeletor: You may have tricked me this time, but be warned. You have not seen the last of me. I will find my way out of this time trap, and return to challenge you again, He-Man. Of that you may be sure. 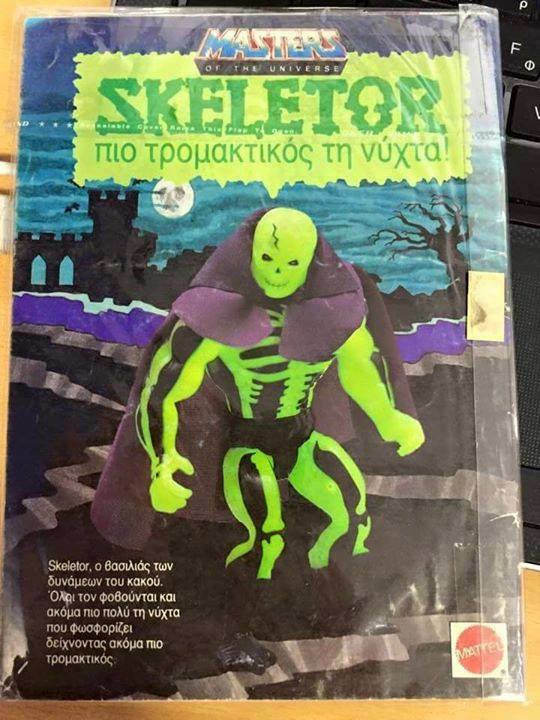 You have not seen the last of Skeletor. I will have revenge. Revenge! Revenge! Revenge! 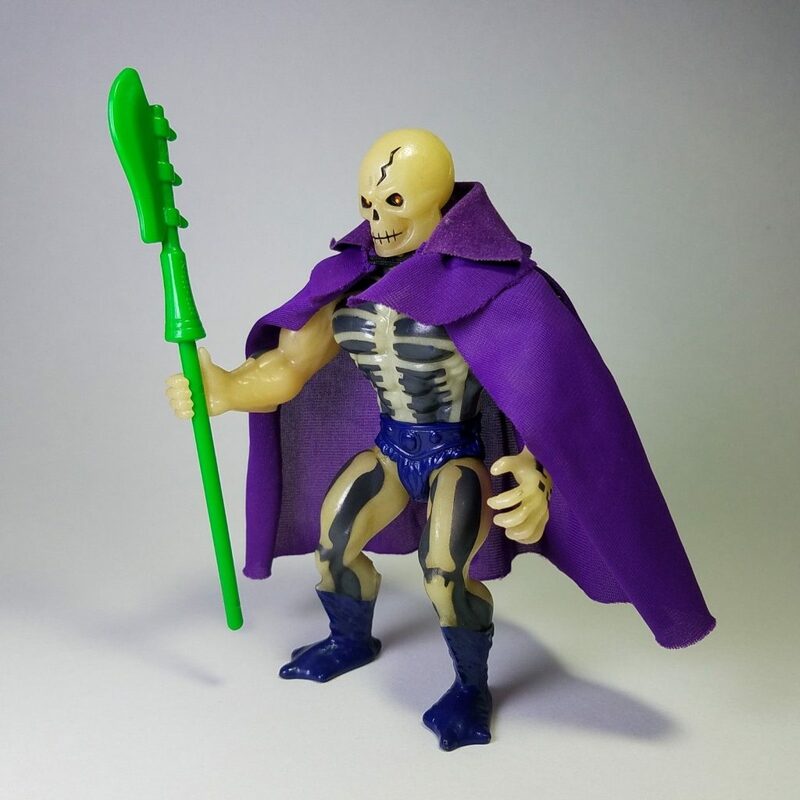 The voice of Skeletor faded away to nothing and he was gone, lost in the swirling infinity of time. 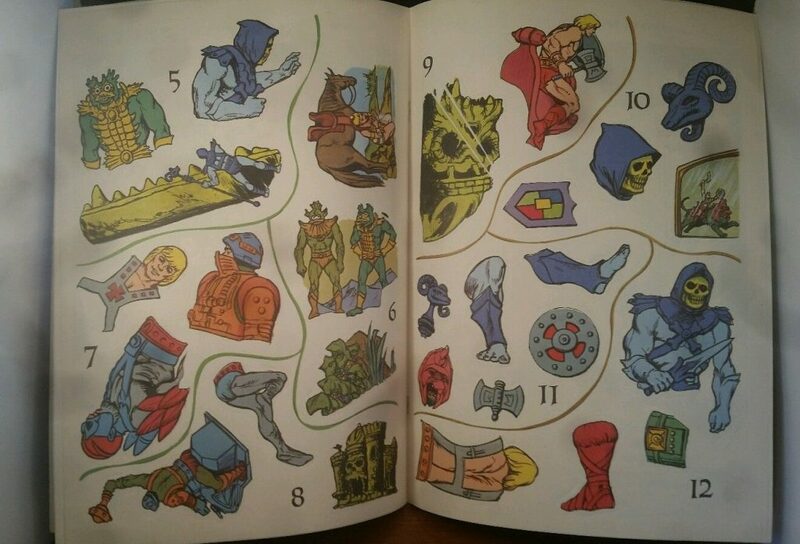 But He-Man knew better than to count his enemy out. 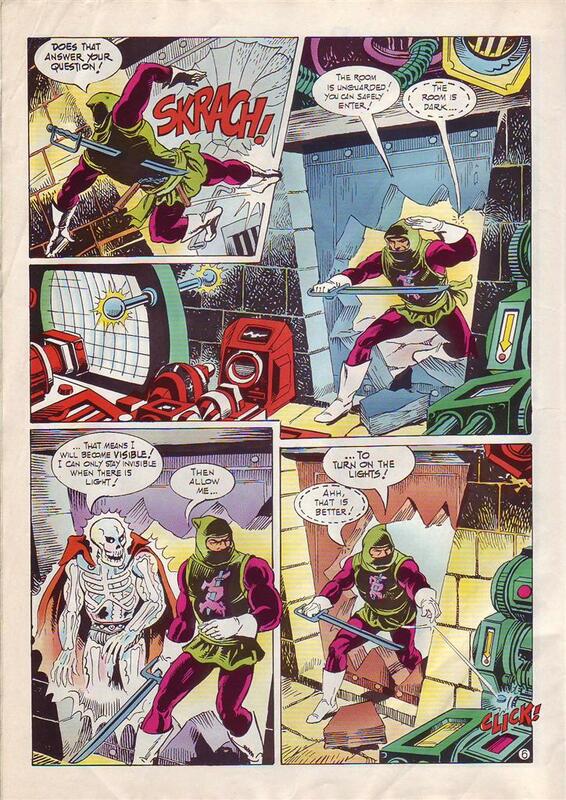 If anyone could find his way back from the depths of history, it was the evil Skeletor. And if it wasn’t Skeletor, it would be yet another foe. For there is always some selfish soul ready to take up the low road of tyranny. 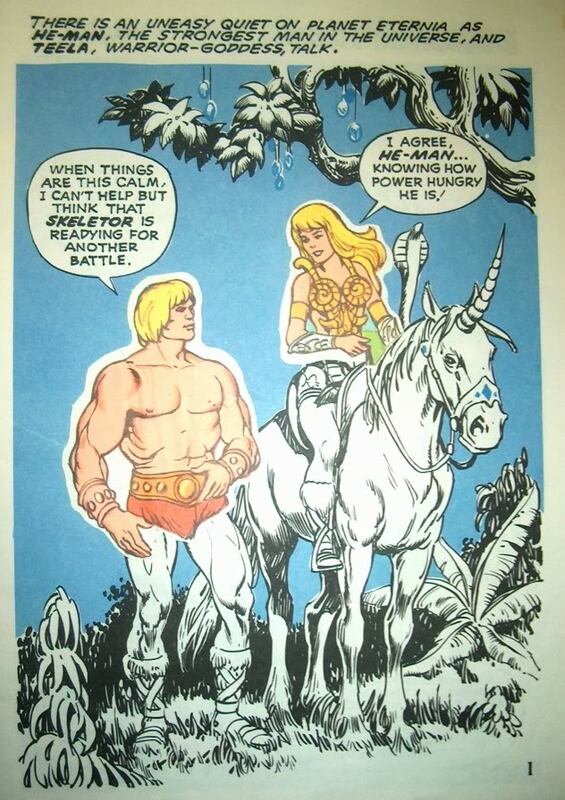 He-Man knew at that moment that the battle would never be truly over. In his heart, he knew that he would struggle all his life against the cowards and bullies who mistake gentleness and concern for weakness and fear. But if there were battles to be fought, he could think of no better cause. It was as old as time itself. All across the infinite universe, thousands of brave men and women were carrying on the struggle against tyranny. He was but one lone soldier in an army of heroes. 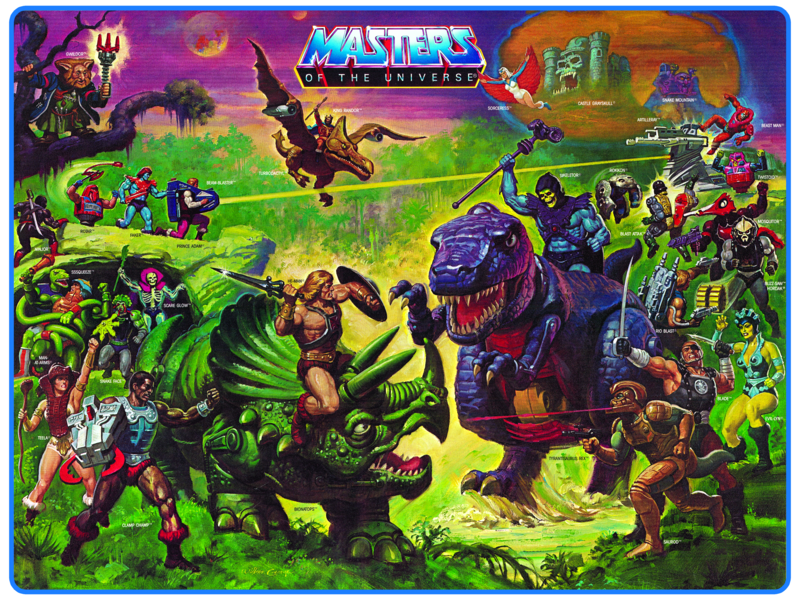 Together, they were truly Masters of the Universe. 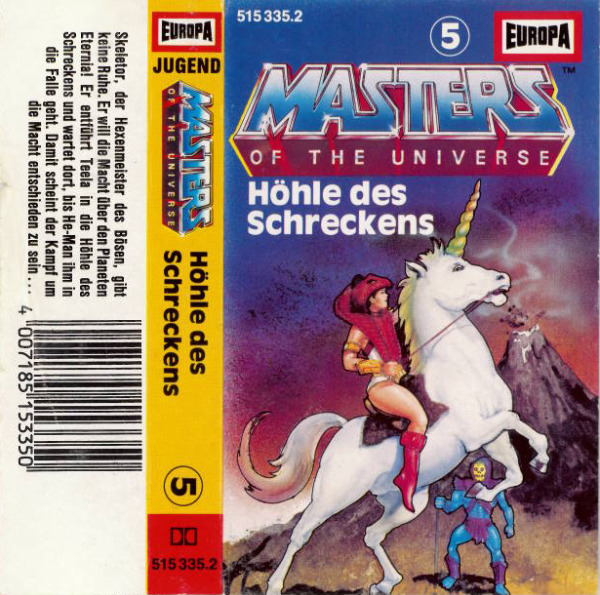 In some of the earliest media produced for Masters of the Universe, Teela is often depicted riding a golden horse or unicorn. The animal is never given a name, but is referred to as a “unicorn charger”. 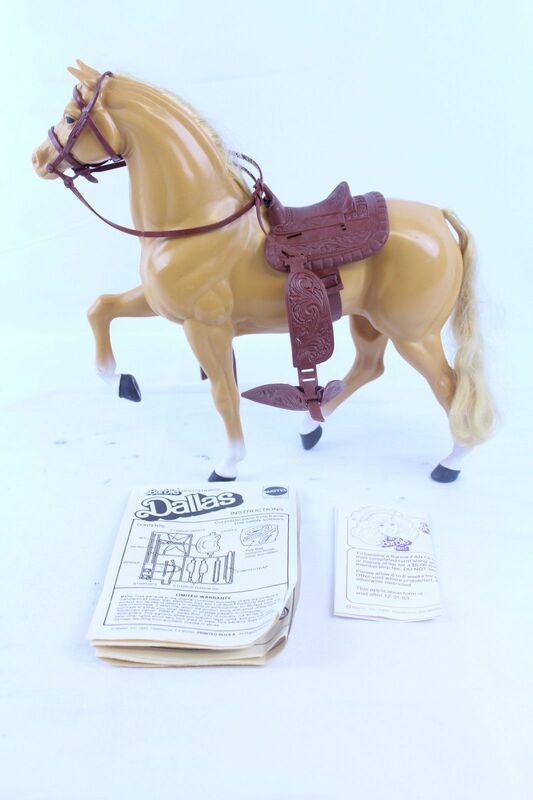 Fans have taken to calling the steed Charger for that reason. 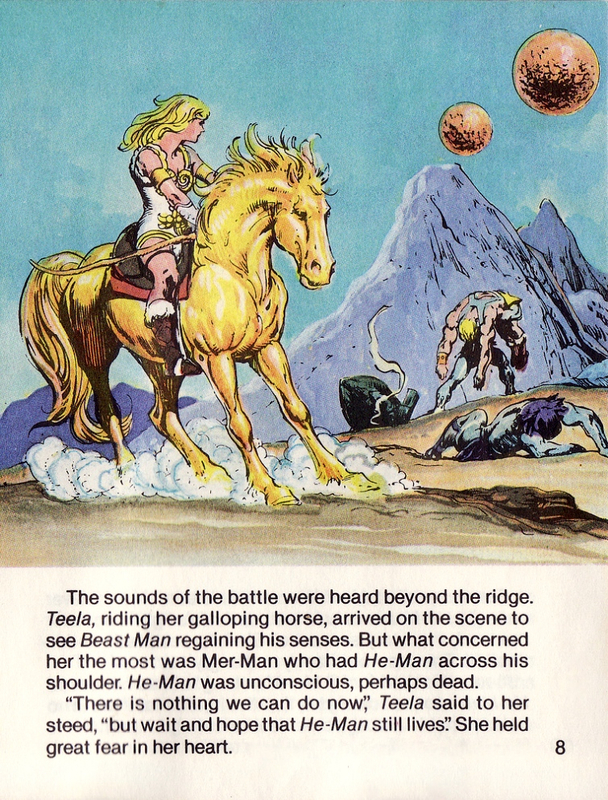 The Barbie horse, fixed or poseable legs, can be adapted to He-Man by changed color and added parts of armor, etc to make a horse vehicle. 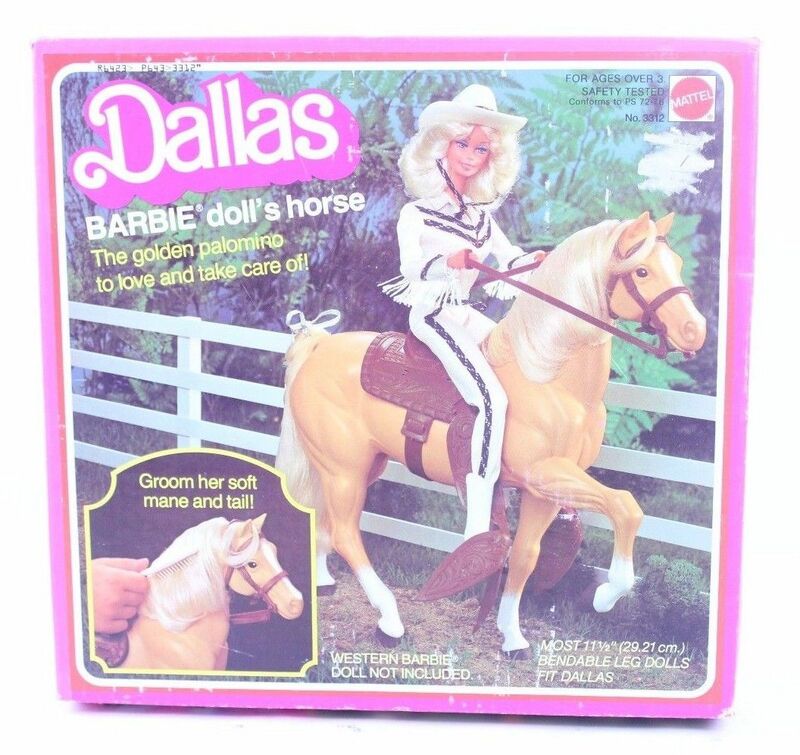 In fact, there was a Barbie horse named Dallas, released in 1980 or 1981, that bears close resemblance to Charger as depicted in the first series of mini comics. 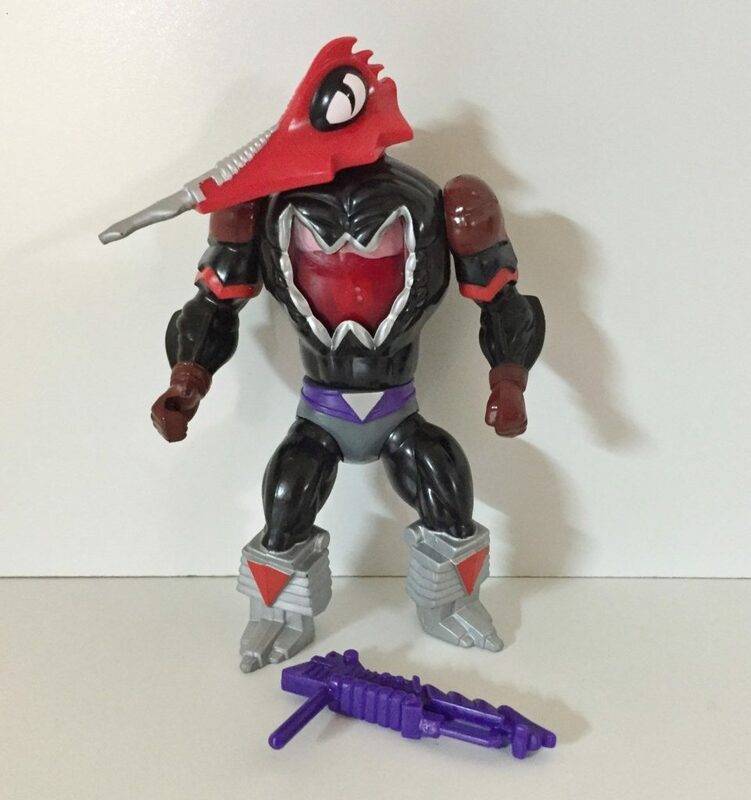 Several Masters of the Universe toys were reused from previous Mattel toylines, including Battle Cat, Panthor, Zoar and Screeech. 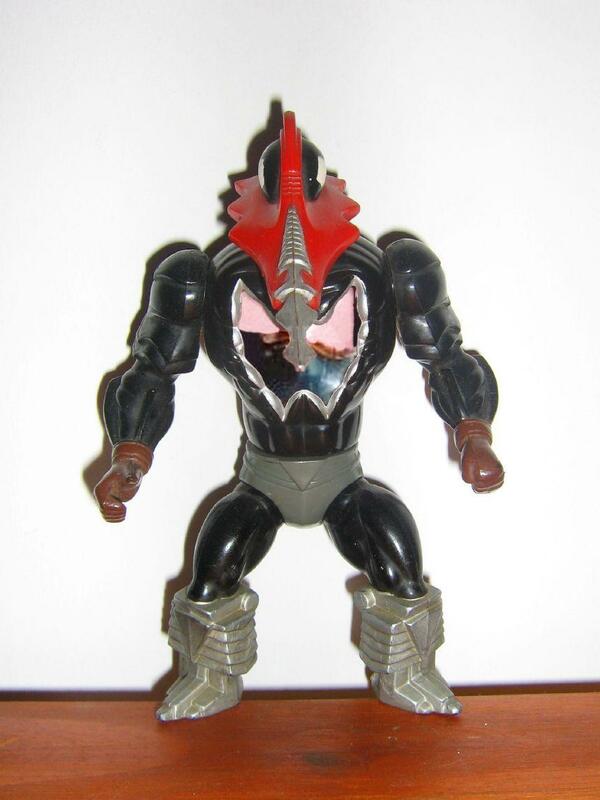 Charger was never released in the vintage MOTU toyline, but I think he/she would have fit right in. 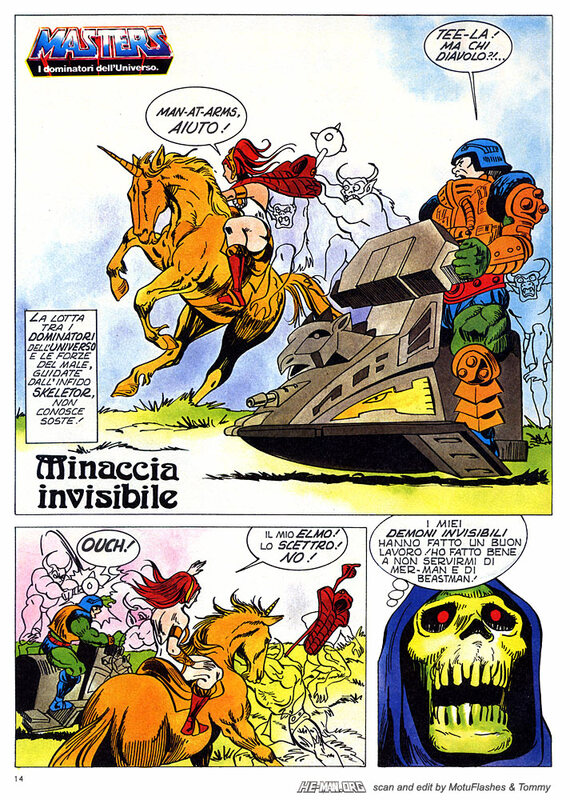 Charger appears as an ordinary horse in subsequent mini comics released in 1982, including Battle in the Clouds and The Vengeance of Skeletor. My speculation is that it would have been expensive to add a horn to the Dallas buck, so the concept was simplified to require no additional tooling. Of course it’s possible that this is just a fluke and not a planned change to the design of Charger. 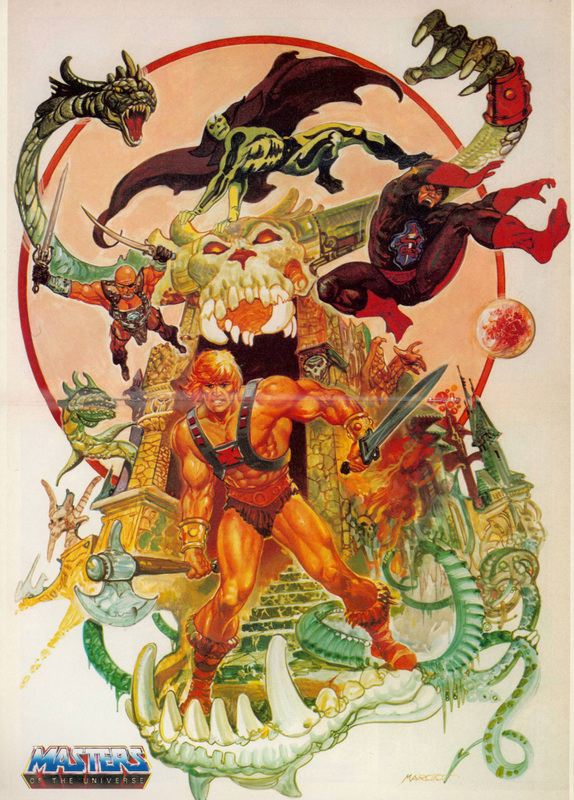 Image via He-Man.org; scanned and edited by MotuFlashes and Tommy.